Best Western Plus Seabrook Suites est idéalement situé dans le centre de Seabrook. Venez découvrir et profiter de notre hôtel à côté des principaux sites touristiques. Réservation au meilleur prix et offres exclusives toute l'année. Amusez-vous au soleil avec votre famille dans notre piscine extérieure. Utilisez le canapé-lit dans notre suite avec lit king size si vous voulez plus d'espaces de couchage sans avoir à payer une chambre supplémentaire. Venez passer une nuit reposante dans notre suite avec lit king size. Animaux acceptés dans certaines chambres seulement. Avec la Kemah Boardwalk à proximité, cet hôtel de Seabrook offre à ses clients tout ce dont ils ont besoin pour une escapade romantique ou un séminaire d'affaires. Les hôtels de Seabrook, au Texas, sont connus pour leur hospitalité du sud et offrent une excellente situation. À proximité de Galveston Beach, les voyageurs qui séjournent dans notre hôtel bénéficient des meilleurs tarifs, à seulement 30 minutes de la plage et de la mer. Le centre spatial de la NASA est également à proximité, et l'hôtel est fier d'accueillir régulièrement des fonctionnaires, des astronautes et autres grands voyageurs. Les clients soucieux de leur budget qui recherchent un hôtel à Kemah Boardwalk trouveront leur bonheur dans cet hôtel. Les hôtels de Seabrook, au Texas, peuvent être coûteux étant donnée leur situation en bord de mer. Mais ce n'est pas une fatalité. L'université de Houston-Clear Lake se trouve près de l'hôtel et de nombreux étudiants, enseignants et leurs parents choisissent régulièrement cet hôtel à proximité du campus mais offrant calme et tranquillité. Les voyageurs d'affaires avec les usines chimiques à proximité comme Dow® Chemical et Celanese bénéficient de tout ce dont ils ont besoin pour s'occuper de leurs affaires. Les employés du gouvernement ainsi que ceux de Boeing et Lockheed Martin sont également des clients réguliers. Proche des principales entreprises, mais avec assez d'espace pour organiser des réunions (et quelques loisirs), cet hôtel de Seabrook est à seulement 3 kilomètres de la promenade et à une dizaine de kilomètres de l'université. Profitez de Johnson Engineering et du centre de recherche Space Hub de la NASA, à huit kilomètres seulement de l'hôtel, pour un vrai plaisir. Quel que soit votre programme, vous pourrez tout prévoir parfaitement en choisissant bien votre hôtel. Réservez votre prochain séjour au Best Western Plus Seabrook Suites ! Passez un excellent séjour ! The room was muggy and damp, and had a musty smell. There was black spots on the curtains above the ac unit, presumably mold, and also some on the wall in the bathroom. The mini fridge was old and had broken plastic inside. The last couple nights my husband woke up with bug bites all up and down his arm and on his feet. The beds were comfy, but if there are bugs, it kind of defeats the purpose I think. When we told the front desk, they said they would "look into it" which to me means "I don't care." the pool was nice, and breakfast was good. If thru take care of the issues, this would be a nice hotel. "Meh...felt more like a Super 8, but $90/night!!" Good hotel for the price, but Hampton Inn it is not. —Front desk clerks weren't anything special - seemed a bit put off when you brought them a concern. —Our toilet got clogged...twice...for no apparent reason! —The phone on the room didn't work, making it difficult to ask for more towels, since they only provide two. 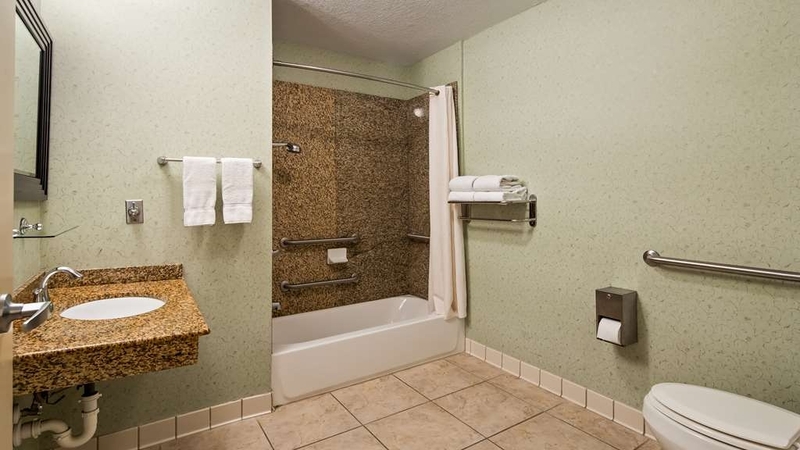 —Typical small bathroom, but large door problem, for this type of hotel. —Shower hot water was inconsistent. Sometimes it was scalding and other times barely lukewarm. Watch out for your kids in the shower! They could get burned! —Stains on carpet —Breakfast nothing special and lacked oatmeal. —Ice machine on our floor didn't work. —No refill of toiletry items from day to day. "Stay Clear of this place !!!" It was a great value for the money. We got what we paid for and we happy with the entire stay. Room was modern, clean and everything worked. Check in and check out were flawless. The breakfast was great and ample space for guest to eat was available. Excellent location - right on the beach. Property is also convenient to several decent restaurants. Check out the "Skyline Diner" just around the corner. 50's theme, spotless, great value with nice portions. Homemade biscuits made on the premises. "Economy Plus Hotel for the budget minded"
I got this reservation from a Hotwire deal. It was only minutes away from the Kemah Boardwalk area. I was travelling with my family and we needed a hotel in a pinch when we decided not to drive back home that night. We arrived at this location which is behind a shell station and on the edge of a large field which boarders a oil refinery in the distance. It's a little hard to get to as it's located off of an off-ramp from the local highway, so if you miss your exit, good luck trying to get back to it. Nonetheless there was plenty of parking, the building was clean and when we walked in were greeted with a smile from a nice lady named Carla. She checked us in within a few minutes we had our room cards (no one has keys anymore) and we made our way up to our room, #235. It was at the end of the hall, a corner room with overlook to the parking lot. 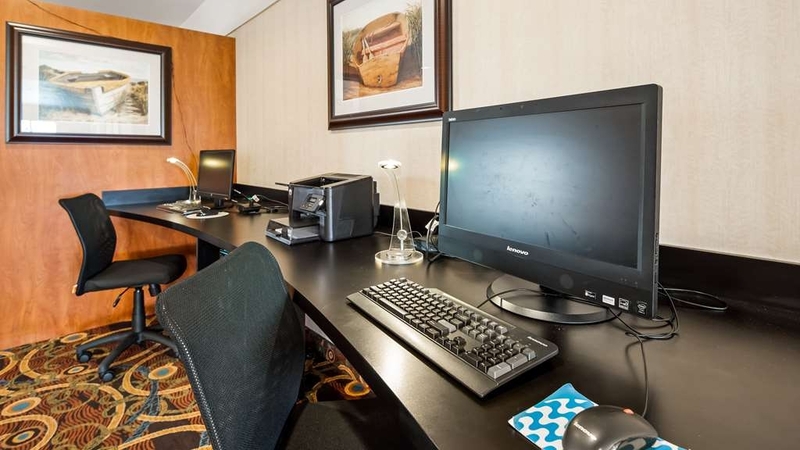 It was a handicap access room (two peepholes in the door) and extra wide room with a single queen bed, a living room area with a couch and coffee table and a huge desk for my son to hook up his laptop. The bathroom was spacious. The bed was comfy ( I was later informed they were new beds). There were plenty of pillows so I slept well that night. There were a few downsides. The lamps and the clock by the bed were unplugged, no biggie I plugged them back in and turned the lights on. Then I noticed no TV remote in the little cardboard box that says its a clean remote. I went to the front desk and Carla gave me a new remote, but knowing what I know about TV's, it wasn't going to work unless it was paired first with that TV. Sure enough it didn't work. I figured out the TV with the one button for power and navigation. In the end I just turned it off and read my book, I was on vacation after all, we're supposed to unplug right? (yeah, sure). I sat in bed playing games on my phone while trying to convince myself to read my book. I woke up feeling rested, bed did it's job. The only negative was when I walked into the bathroom there was a sewage type smell eminating from I guess the drains. The smell was only in the bathroom. I did not report it to management, my bad I guess. We packed up our stuff and headed down to the counter and there was the same lady Carla from the night before. We checked out and had a great breakfast, especially like the Texas shaped waffle iron. They had egg, grits and biscuits, along with the usual. For the price it couldn't be beat despite my small issues. 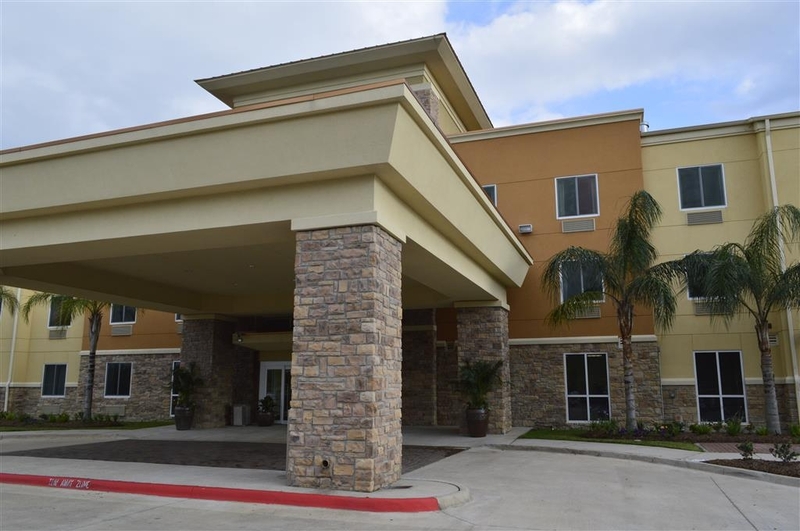 "Great place to stay outside of houston!" Staff is second to none, breakfast was good and room was excellent for the money! Hotel was easy to find and has a gas station and subway within walking distance. Staff was very friendly and always willing to help. Enjoyed my stay , staff were very professional and helpful rooms were cleaned and felt satisfied with my stay there could have been a little better. some minor issues but were taken care of by the staff. "Not ideal location or accurate website"
This hotel's website stated that a shuttle was available for short distances at no fee. I was told at arrival that this did not exist and the next morning the new front desk staff said it was under repair. This now cost us additional to go to NASA's facility which was within the boundary stated. The lying continued when on our last morning we woke up to no hot water and the ftont desk sign ssid a pipe burst in Seabrook which was later proved to be wrong and it was only a problem at the hotel. Things happen, I understand, but the lying was not necessary! It also was not within walking distance to much. Only s convenience store and 4 other little stores which included a subway. Breakfast included was a nice perk and the staff was friendly. We were looking for an affordable hotel in the greater NASA area before going on a cruise out of Galveston. It is also about 6 minutes away from Kemah boardwalk. The BW fit the bill. The room was little dated but clean and comfortable. Breakfast has a number of options for everyone including my daughter who has celiac. They keep seperate gluten free items in the back - you just have to ask for them. I would stay here again when in the area or before a cruise. Price was good, Breakfast was excellent, good variety, you can make waffles the shape of Texas, Room was clean, Large room, had nice comfy bed and a pull out couch. Staff helpful and friendly, check in and out was easy. "Very spacious room with good breakfast"
We stayed here the night before we left on a Carnival Cruise. 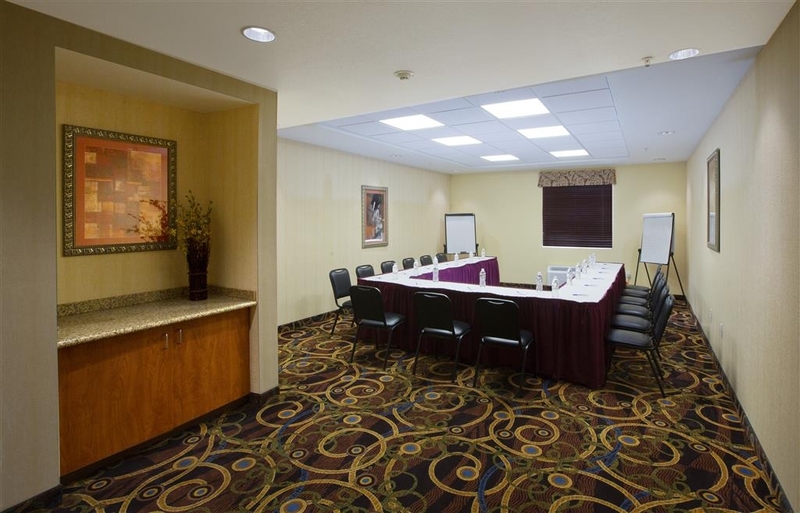 We reserved 2 rooms directly with the hotel, for a great rate. The rooms were very spacious! The room with one King size bed and the other room with 2 beds, BOTH included a sofa bed. The rooms also included a mini-fridge and a microwave. The bathroom was also very spacious. The hotel property, as well as the rooms were clean, breakfast was good. The check-in process was very easy. The staff was super helpful. My aunt forgot to print an email at home that she desperately needed for the cruise and the front desk was kind enough to print it for us. I really look forward to staying here again in the future! "I rather stay somewhere else." The front and lobby are well decorated. Rooms are small. We got one with sleeping sofa which is very convenient. But the sleeping sofa was very uncomfortable. The mattress was thin and the legs were not straight. Breakfast was just ok. Not much variety and they didn't have plates. They said they were out. So we had to use little plates. I guess we went on a bad day based on the good reviews it have. 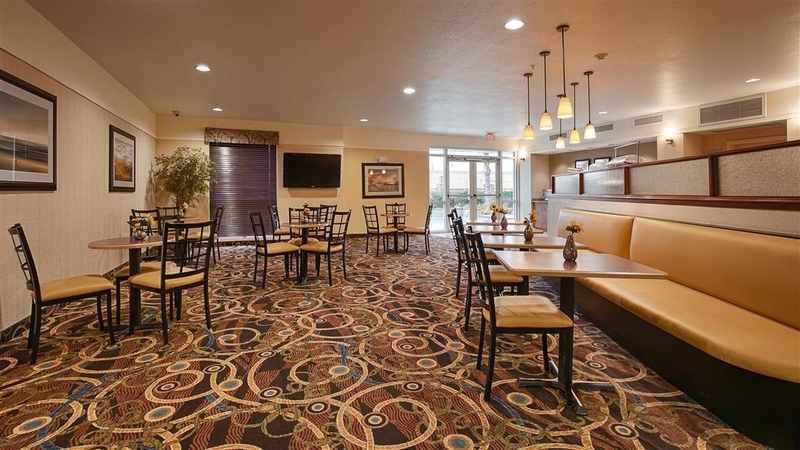 Hotel was clean, staff went above the call of duty and were very friendly, complementary breakfast was on par with most hotel breakfasts with both hot and cold selections, location was close to Johnson Space Center. 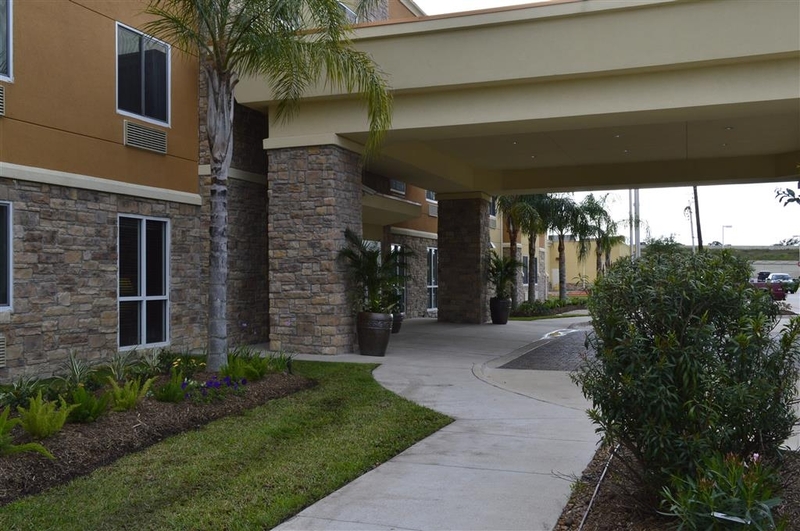 "Off the freeway but in a good location"
The Seabrook Suites is a remodeled hotel with a good location in Seabrook. 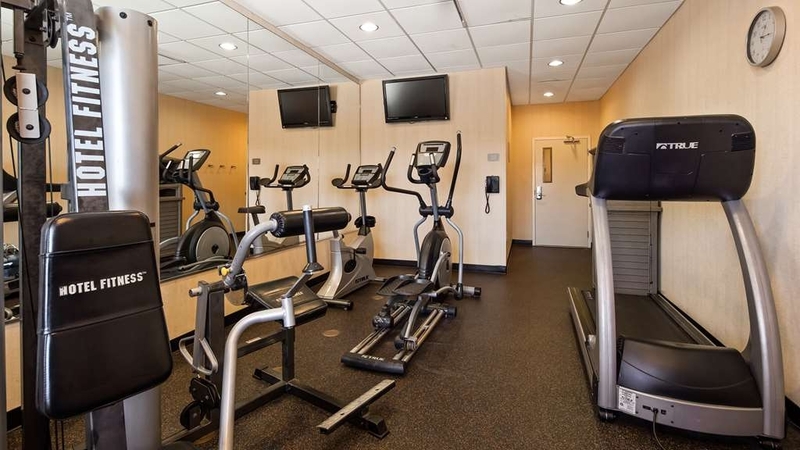 Right off the freeway, it is within five minutes of a number of stores, restaurants, and other amenities. Plus, there is a gas station and mini-mart right next door. The Johnson Space Center, Fry's, and other locations are less than 20 minutes away. The room was very nice, the first one where there was a couch and chair available to make a visiting area. Even being next to the freeway, the room was quiet. It was the first time my wife stayed in a BW since her childhood, and she was suitably impressed, as she normally stays at Hilton and similar quality hotels. Breakfast was great, as usual. My wife is on a diet, and when I asked if there was a special item in the kitchen, the staff wasn't able to provide but offered to go to the mini-mart next door to accommodate. We declined, but I was shocked at the offer, as most people wouldn't bother to do that. 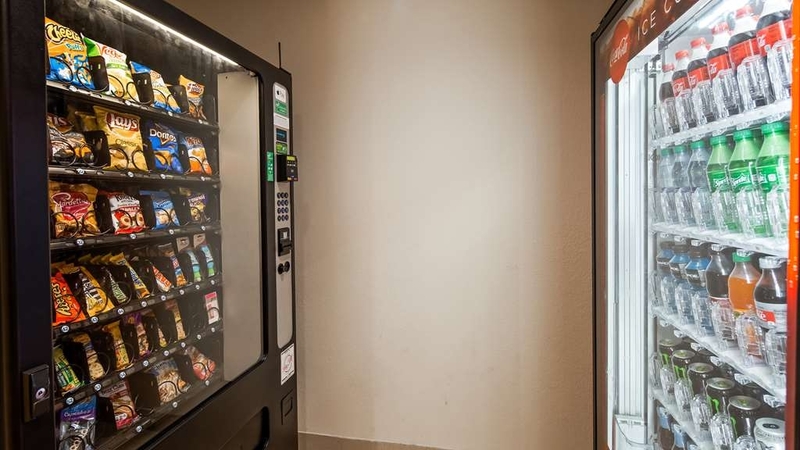 Coffee, tea, hot chocolate, and hot water are available in the lobby 24/7, which is unusual. Normally, those are only available during the day, in my experience. The cold cereal for breakfast was also left out, so I guess if you really wanted a snack, you could fill a bowl. The outdoor pool is open year-round, but a large storm blew threw the night we arrived, leading a cold front of 47 degrees, so we didn't bother testing the water. Finally, when I made the reservation, it was just for myself, as I didn't know if my wife would feel up to the trip. She decided to come along but we weren't charged extra for her to stay in the room, which was a nice courtesy. Overall, a nice place to stay when visiting the area and the rates are very reasonable. This Best Western Plus must be brand new, everything in it seemed like it was. Great breakfast, nice extra comfortable beds and plenty of space in the room. I would definitely come back to stay at this hotel whenever I'm in the area. Thanks BWP Seabrook Suites! Thank you for letting us know that we exceeded your expectations! We appreciate you staying with us and we look forward to serving you again. Quick, friendly checkin. Nice modern lobby.. Very friendly staff. Clean updated room. Good breakfast. Limited restaurant next to the hotel. Quick checkout. Only subway shop next door and gas station.Never had time to checkout the Kemah boardwalk which had restaurants. Thank you so much for your feedback and recommendation. 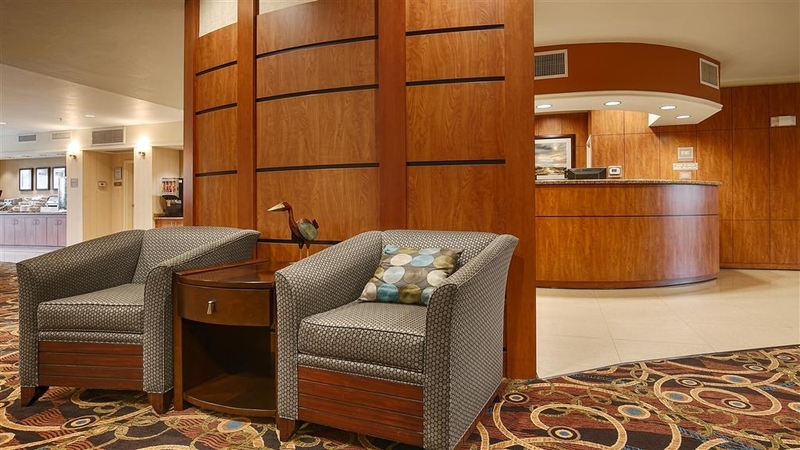 We appreciate you staying with us at the Best Western Plus Seabrook Suites and we look forward to your return. "Not BW plus standard "
This hotel was ok but definitely Not a. B/W Plus. Hotel was old hallway smelled like old oak furniture. A/C was ok but shower neck in wall was coming apart .some employees decided to deep clean breakfast tables during breakfast with buckets and brushes. Good initiative but bad timing decor was nos updated to the plus standard. Thank you so much for your feedback. We appreciate you staying with us and we look forward to your return. This is a nice place. The staff is OK, the breakfast was ok-oh, but the room was quite good and the location/parking too. I got there quite late in the evening but the staff was service-minded and professional. I will definitely use this hotel again. 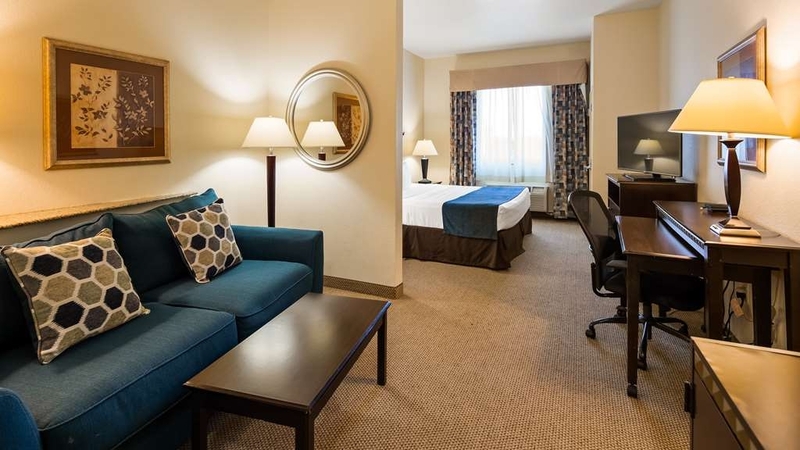 We are so appreciative that you took the time to complete an online review of your recent stay with us at the Best Western Plus Seabrook Suites! We are elated that you enjoyed your stay with us as much as we enjoyed having you here. We look forward to your return! Our Stay at the Seabrook Best Western Plus was very comfortable. The Hotel is vey upscale, clean & fresh. The bed was very comfortable. The room was clean and fresh, all newer decor. A lover an enjoyable stay. They offer a good breakfast coffe, and refreshments through the day. Hotel was very clean and convenient to most everything near Kemah and NASA. Was even a fairly easy commute to downtown Houston. Staff was amazing and so friendly and inviting. Pool was clean and well taken care of it seemed. Beds were very comfortable. For the money, a great place to stay. Thank you for taking the time to complete this review and tell us about your stay. It is always our mission to ensure every guest has a positive, memorable experience and I am sorry to hear we fell short in this instance. Please accept our sincere apologies for not meeting your expectations. We hope to have an opportunity to better serve you when your travels bring you back. "Spacious room and good breakfast"
We stayed in Seabrook the night before our cruise out of Galveston. The price was great for the accommodations. It was easy to find, right off the highway. And easy to get to the boardwalk in Kemah. We had a spacious room; we were moved to a handicap room which wasn't what I booked online but was okay. Our only complaint about the room was it had an old person smell to it that lingered on our luggage even after we left. The breakfast had many options that all of us could find something to eat. The lobby is very welcoming and sleek in design. The staff was very friendly and helpful and gave suggestions for dinner. The room was accommodating with no issues and comfortable beds. Breakfast in the morning was good and check-out was easy. Thanks for taking the time to send us the great review. 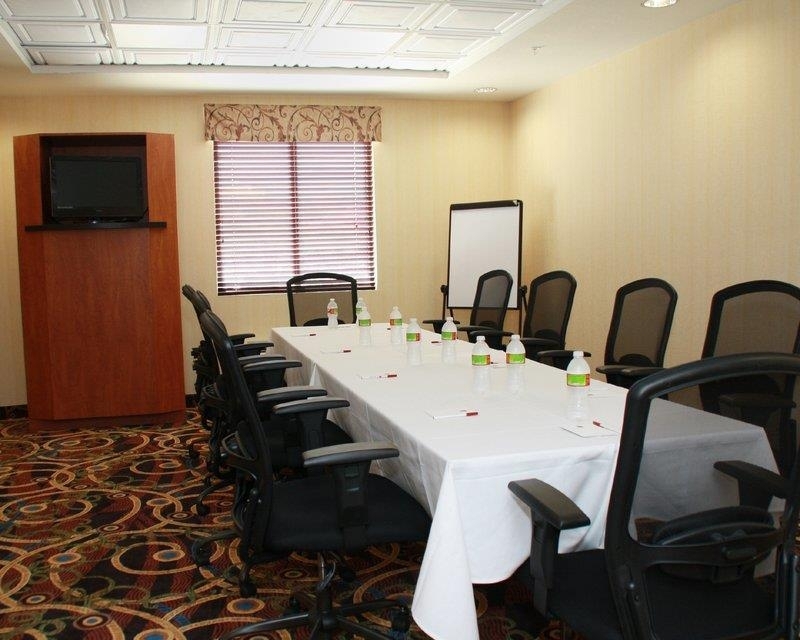 We hope to see you again soon at the Best Western Plus Seabrook Suites. We usually stay at this hotel when taking a cruise on Royal Caribbean from Galveston. 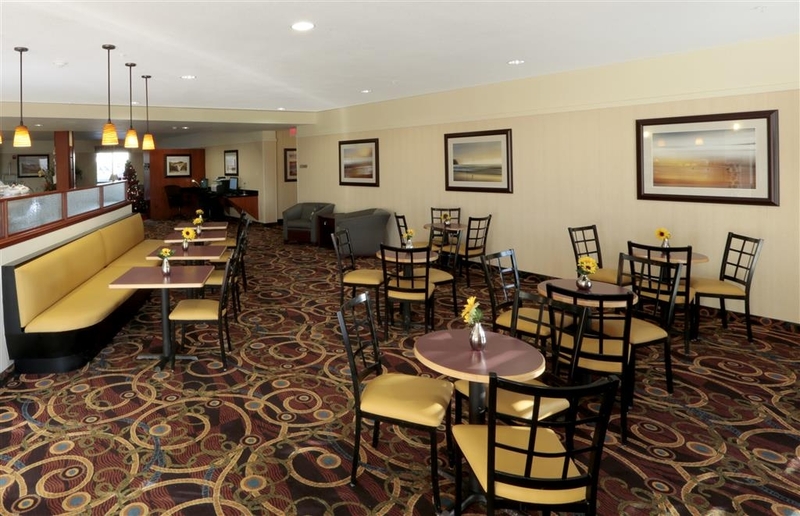 It is conveniently located to stores for last minute items and restaurants to dine. It is very clean and comfortable with the essentials provided for a nights stay. The employees are friendly and hospitable. There is is a nice generous breakfast bar offered to start the day. We would highly recommend! We stayed at this place in 2017 and previous cruise trips. Thank you for sharing your experience at the Best Western Plus Seabrook Suites. 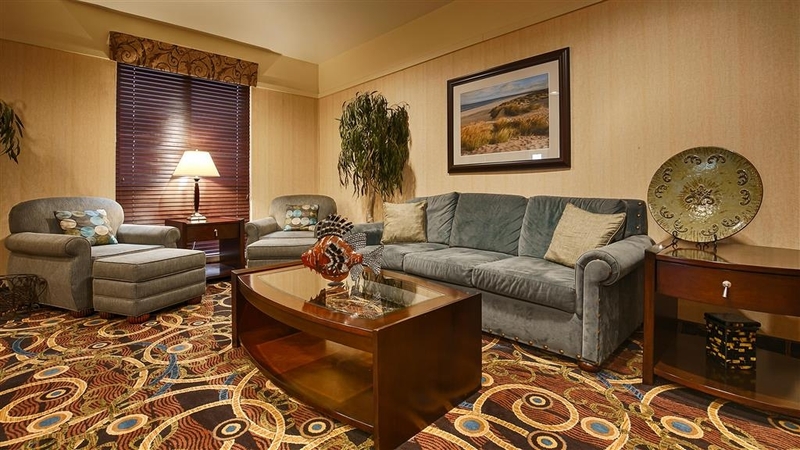 I'm happy to hear that our service and our great amenities made your stay more comfortable. Hope to see you again soon. "Nice Hotel For Your Money !!" We stayed the night in Seabrook,Tx on the way to Galveston Island. This hotel was kinda of a last minute decision . My only complaint was it took forever to get check in because they had a line of people and only one person working the desk. The rooms were large but very clean. All the staff were friendly and welcoming to us. The pool and breakfast was a plus. It would have been better if thier ice machine was up and running !!! Thank you for taking the time to send such a considerate review of your recent stay at the Best Western Plus Seabrook Suites. It is of upmost importance to us that our facilities are clean, that you are met with the best service and enjoy our amenities in every way! We look forward to your return visit! "Was the only availability "
We stayed for one night but nearly left in the middle of it. Unfortunately we will be returning because we'd already booked a night in July so maybe things will be better? The location was great, a straight shot from Kemah Boardwalk. Check in was simple and we were able to get to our room nearly an hour early. Arely? was very friendly. Our room smelled very strongly, nearly overwhelming, of air freshener but not clean. The carpet and bed skirt had powder which I believe was the source of the strong smell. The carpet, bench, sofa and chair were all badly stained. The bathtub still had hair in it from a previous guest, fingerprints all over the desk and the remote which claims to be easier to clean was sticky. The a/c blew cold and was the standard super loud. The noise from the rooms around us was ridiculous until nearly 3am. We didn't use the pool and it was raining the majority of the stay so didn't see anyone else either. The bed wasn't the worst ever but the blanket was terrible and there were no extras provided. Breakfast was a joke, hard boiled eggs were disgusting, pastries seemed old, the hot food was nearly 30 minutes late and only consisted of bacon and an egg scramble with sausage. It is never ones intention to use this medium to hammer an institution but our visit to this hotel for the past 3 nights has been nothing if not unpleasant. Upon registration - we were a party of 3 booked suites - the allocation of the suites was mixed up and the single suit was incorrectly allocated. We were the victims of this error but to keep the peace we just advised reception of the error of their way but asked for no remedial action. The main lamp in the room did not work but this was corrected the next day when reported. After the second night was a Sunday and the room was very poorly serviced wirh plenty of evidence to confirm there had been no quality control or supervision.. The real problem came on Sunday night. Rules of the house clearly state the the swimming pool may only be used between 8am and 10 pm. Given the proximity of the pool to the accommodation these hours are indeed generous. On the night in question a group of guests were still revelling in the pool area at 1.am eventually retiring around 2.30am! The desk was called and a complaint and request for management intervention was made to no avail. A second call to the desk to register further frustration caused by the pool party simply went unanswered. At breakfast the next morning a request to speak to the manager was treated with a reply that the manager would only report for duty at about 9.30am. We departed at 9.15 . There was no sign of the manager at that time. The room for that night was $112.00 not a steal when compared with later room charges which provided a good nights peace and quiet! 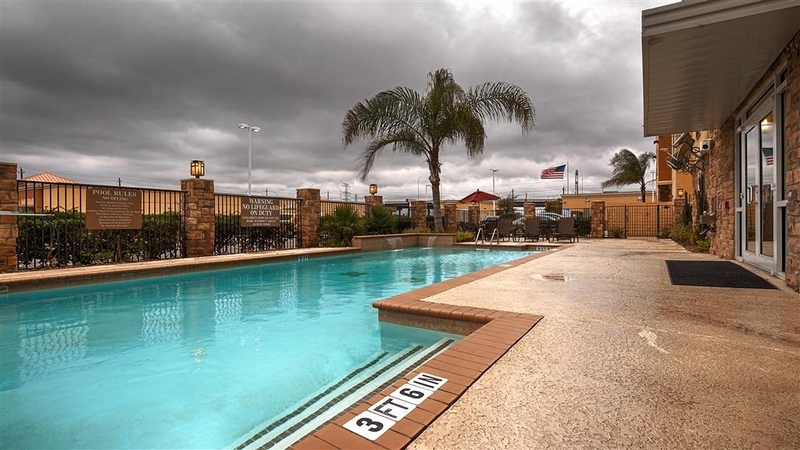 "Good Location and Price, but Challenges with Expected Amenities"
Our family stayed here in August 2017 while visiting the Seabrook/Kemah area. We had a two queen suite with pull-out sofa bed. With four adults, the extra space was appreciated. Tiffany was working the desk and check-in was smooth. Tiffany was nice, but she seemed to be the only one working. I had to go down to the desk several times to pick up needed items. We had an issue with our refrigerator in our room. When I called the front desk, they gave me instructions to troubleshoot and said if that didn't work, they would call maintenance for tomorrow morning. We had items that needed refrigeration overnight. The manager did show up and replaced it with another refrigerator. While AC worked well, the vents were not adjustable and cold air was blowing directly on the nearby bed. TV reception was poor on several channels. Breakfast was a challenge, as the staff could not seem to keep up with demand. Several times we had to wait for food to be prepared, especially the eggs (which were real because I saw them bring them into the kitchen). While the food was good, it often wasn't there. While the cost was reasonable, the challenges we had for such a short stay makes me uncertain if we will be back the next time we are in the area. I visit Seabrook regularly and The Best Western is always available. The front desk clerk knows who I am and has my room ready to go when I arrive. The room is always clean and furniture is moved and vacuumed. Thank you so much for the wonderful response regarding your stay with us at the Best Western Plus Seabrook Suites. I am delighted to hear that you enjoyed your time with us and that our amenities exceeded your expectations. I hope we will have the pleasure of seeing you the next time your travels bring you to Seabrook! Thank you for choosing to stay as our guest and for taking the time to write such a nice review. We look forward to seeing you again. Cannot say enough good things about this hotel! Affordable, very clean, and Exceptional staff. Edward checked us in on the first night and was amazing. Only ate breakfast once because we had plans but it was very good with options for both hot and cold food. 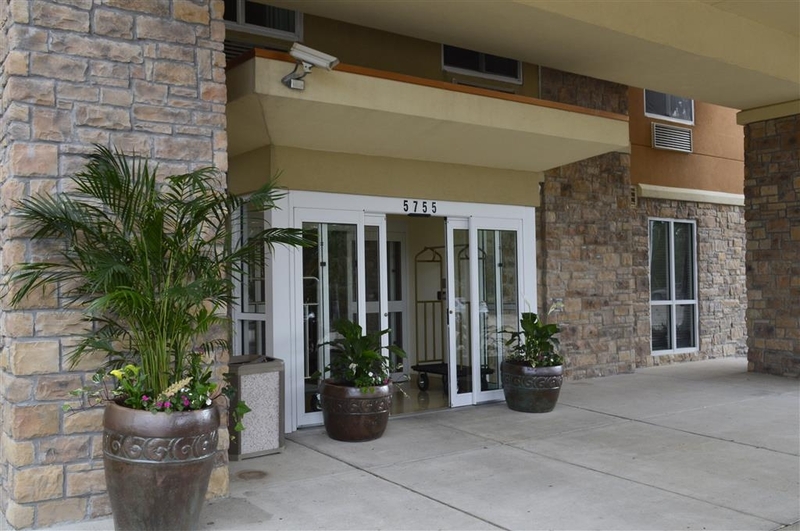 Location is great, very close to several nearby attractions. Close to highway but very quiet inside. Not a lot of foot traffic noise either. Would not hesitate at all to stay here again. Thank you all for a great visit! Thank you for taking the time to share your awesome experience at the Best Western Plus Seabrook Suites with others on TripAdvisor. We greatly appreciate your business and your recommendation. We look forward to serving you again. I checked in for an extended stay but had to leave early because the housekeeping was so bad. They only cleaned my room twice in almost a month and even then it was done poorly. I actually had to get my credit card company involved. Thank you for taking the time to tell us about your stay. It is always our mission to provide a positive, memorable experience for all of our guests and it is clear we have fallen short of our goal in this instance. Please accept my sincere apologies for the issues you experienced in your guest room and with house cleaning. We have forwarded your comments to the appropriate hotel teams to ensure these issues were isolated and corrected moving forward. We hope to have an opportunity to better serve you when your travels bring you back. Spent 4 nites hear, very clean ,and centrally located to attrsion& restraints. Room was nice and roomie for 2 people. Restroom area was big and roomie with a good shower. Maid service was not to good,may need supervisor small thing need A tension. Free breakfast was just ok, lady running the breakfast should be more helpful, Edward at the front desk was very nice and helpful thank for your help!! Will stay again!!!! I am a travel agent certified top selling agent and I have to give it to this hotel. I rented a room for a company that I helped arrange a video shoot for in the area and they needed to be close to the water. This hotel was the one!!! No matter what the hotel ratings are industry wise, this is 5 star service hotel. From the time I called to book and till I checked out there was absolutely no complaints. The food was EXCELLENT. The food was along the lines of a great Embassy Suites morning buffett breakfast. The staff was ALWAYS helpful and smiling and making sure we were taken care of. One staffer held a young lady's baby while she got all she needed to eat and waited till she was done. What great customer service. And EDWARD at the front desk was SOOOOOOOO COURTEOUS and SOOOOO NICE. I told the other staff to look out for him and they told me he looks out for all the staff and makes sure they are taken great care of behind the scenes of running this hotel. I really felt like I was at a 5 star resort. Hands Down. This over night stay was PERFECT! I would stay again and will definitely refer others. Thank you for your feedback and for recognizing our team for the friendly and helpful service they provided you during your stay with us at the Best Western Plus Seabrook Suites. We appreciate your business and we look forward to the opportunity to serve you again. "Comfy bed, nice room, excellent service"
The bed was extremely comfortable. The room was pleasant and the breakfast was the typical sort (yogurt, eggs, waffles, cereals, etc) that you get at hotels. Would definitely stay there again. Only minor issue was the vending machines in lobby didn't have prices, so I got to find out AFTER I bought the juice that it was $2.10/bottle. I was greeted with a smile and the friendliness of the workers was excellent. 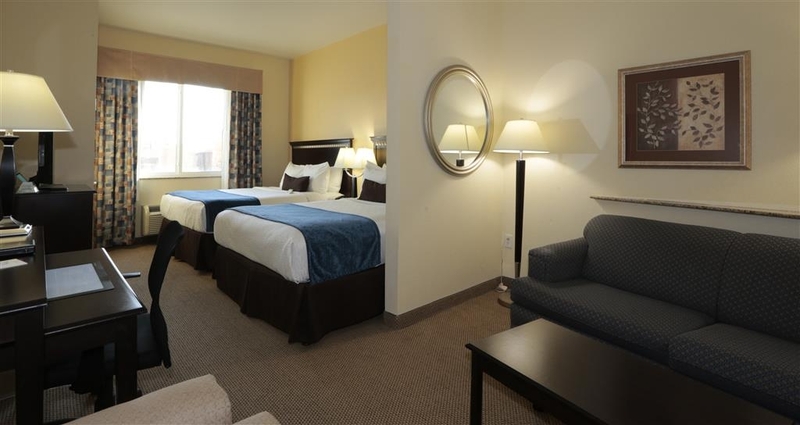 The room was nice and the hotel itself is nice and in a good location with easy access to the freeway. I will be staying again. Keep up the good work Best Western!!!! Thank you for taking the time to send such a considerate review of your recent stay at the Best Western Plus Seabrook Suites. We look forward to providing you the same level of luxury service during your next visit. "Great experience, shared room with another mom!" Cheer competition, had 2 moms and 2 girls in room and it worked out just fine! will be back again soon, thanks for the friendliness of the staff. The breakfast was great, the pool area was nice, very fitting for our needs. We are delighted to see you had a pleasant visit to the Best Western Plus Seabrook Suites. Thank you for your mention of our good service and friendly staff. Come back and see us again soon. I needed a budget-friendly place to stay while attending a training class and chose this property. I was pleasantly surprised and overall happy with my stay. My room was clean and comfortable. There were a few minor maintenance issues (the pipes made a loud humming noise after flushing the toilet), the toilet seat was loose and the shower needed a better cleaning. In spite of these minor concerns, the room was quite spacious, the refrigerator and microwave were nice features, the bed was comfortable and the work space was comfortable and functional. I was disappointed by the lady in charge of the breakfast area. Each day, the breakfast went a little bit more down hill. Butter, boiled eggs, and bananas were not replenished so that by day three, the bananas were black and the eggs and butter were depleted. On day 3, the omelet station (which was supposed to begin at 6:30) still wasn't set up at 7:30. I overheard other guests complaining about the issues with breakfast being late and the impact that made on their business schedule. I did speak with the front desk about the issues and was extremely happy with the swift action on their part. The next morning, every item had been replenished, the breakfast was set up on time, and the breakfast attendant seemed to be working a bit harder to positively interact with guests. For the convenience and price, I would stay here again. Thank you for taking the time to do an online review of our hotel. We are sorry that we could not live up to your expectations. I hope you would give us a second chance your feedback helps us improve in all areas of the hotel and apologize for the experience you stated you had. "I stayed over 100 days in 2017 and they always double charged my credit card , it doesn't matter if I paid in cash"
Thank you for taking the time to complete this review and tell us about your stay. It is always our mission to ensure every guest has a positive, memorable experience and I am sorry to hear we fell short in this instance. Please accept our sincere apologies for not meeting your expectations. 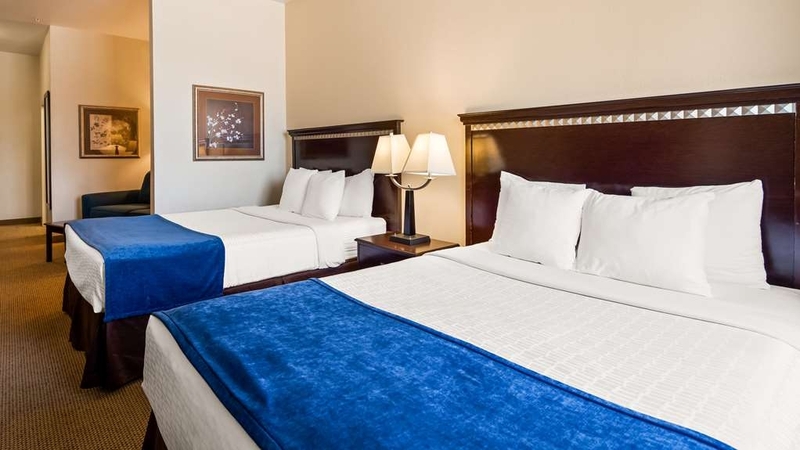 Hotel is located near Kemah Boardwalk with many great eating options nearby. Traffic can get heavy but there is a fast food restaurant and convenience store within walking distance. Area is well lit and well maintained. We are delighted to hear you enjoyed your stay at the Best Western Plus Seabrook Suites. We trust you will come back soon and make this your choice for another hotel stay the next time your travel plans include Seabrook. Gate from pool is installed backwards and smashes everyone's fingers. Room smell like cigarette smoke, mold, and bbaallls. Most of hotel pretty bad. No cookies at front desk. Breakfast is really really bad. They have a photo of eggs and sausage. Open and surprise it's slop. I think a mixture of blended sausage and biscuits. Maybe other leftovers. The next morning not even cold slop. Just a couple of boxes of donuts and cold kolotchies. I asked if they could turn on juice machine and they said they lost the keys to it and the kitchen. I would have been happy with some fruit and juice. "Adequate, but leaves a lot to be desired"
If you want a comfortable room in a convenient location, this is a good choice. Many of the problems I experienced are due to mostly staffing issues and a minimum effort to please customers. Breakfast is the minimum BW provides and in this case, some things below even BW average. Breakfast for me is a big deal because in my line of work, lunch often doesn't happen. All BW's serve the corporate breakfast. If they do the max, it's a decent breakfast, but this one falls short. Room service was below average, but that's a personnel problem. It was clean enough and comfortable; just inconsistent. This is a dog-friendly hotel. I'm a dog lover, but dogs keeping me company while I eat my breakfast is a bit much. This is not a bad hotel. It was comfortable and worth the money. You just get the feeling that when it comes to the extra mile, these folks don't go an extra 10 feet. Thank you for your feedback. I apologize we didn't meet your expectations. We are improving everyday. When in the area kindly try us again and let us know how we're improving. My first time staying @ BW Plus! I have a great stay. It was easy access to a major highway and had a gas station/convenient store next door. I'll be staying here again the next time I'm in town to visit family. Thank you for taking the time to tell us about your most recent stay we want all of our guest to feel not only welcome but like this is there home, it was a pleasure to have you as our guest and we are delighted to hear we have met your expectations. We look forward to welcoming you again. Great stay, met the New General Manager and she is a great! Breakfast attendant kept everything replenished and I love the waffles in the shape of Texas. Room and services were outstanding. I will use this hotel for all my visits to Seabrook and South Houston. Thank you so much for sharing your excellent experience at the Best Western Plus Seabrook Suites with the rest of the world! We are grateful to have had you as our guest and we hope we have the opportunity to welcome you back again soon. "Great location look 4 star and the breakfast was awesome"
Great hotel and wonderful location service was great we had a little problem and the manager on duty resolved it very quickly so I will consider it a plus point my daughter also talked with the Gm and she was pleased they treated us like a family. Thank you so much for describing your experience while a guest of the Best Western Plus Seabrook Suites. We strive to make positive memories of the guest experience and your comments support the efforts our team members work in every day. We look forward to your return visit. I was happy with this hotel overall. The only thing I had an issue with was ants in the bed when I woke up. I did not notice it when I laid down but there were hundreds of them on the opposite side I slept on. I did not eat in this room so I know that was not the cause. It was on the third floor so y'all might be having this problem with other rooms on the 1st and second. Thank you for taking the time to complete this review and tell us about your stay. It is always our mission to ensure every guest has a positive, memorable experience and I am sorry to hear we fell short in this instance. We hope to have an opportunity to better serve you when your travels bring you back. The staff were the only redeeming quality. The room smelled strongly of mildew, there was water damage in the bathroom, a broken mirror, old cosmetically damaged furniture and very uncomfortable beds. The food was terrible--green eggs and stale doughnuts. Thank you for taking the time to tell us about your most recent stay with us. I was disappointed to hear your experience with us was less than satisfactory. Please accept our sincere apologies for the experience you had regarding your room type. Rest assured your comments will be shared with the team in an effort to prevent any further occurrences of this nature. On the positive side, the staff was friendly, the king bed was comfy,the breakfast was ample and fresh.However, our room smelled moldy and the sofa bed was terrible. We were offered a credit which amounted to $9 off a 3 day stay. We appreciate your feedback. Thank you for staying with us and we hope to be your hotel of choice when visiting Seabrook. Although the facility is nice, the real issue is the terrible housekeeping service and the lack of management interest in correcting the problem. We stayed five nights. When we checked in there was a small piece of paper on the floor of the bathroom. I dropped another small piece on the floor the first night. When we left. The tissue box had one tissue in it when we arrived. Coffee was never replaced, nor were cups. Once we got one hand towel and one wash cloth only. Soap and shampoo were also not replaced until we complained. Bathroom counters did not seem to be cleaned either. Although we complained daily, we were never contacted by management about our problems and there was no improvement. Otherwise the room was nice and the breakfast average for hotels. The only other issue was the smoking area located right next to the front door which resulted in a smoke smell in the lobby entrance area. Although very convient to our family's residence, we will seek another hotel for future visits and can't recommend this one. Sorry we could not live up to the expectations that you had. My staff take pride in the work that we do here and there was some issues that weekend. We apologize for the issues you had in your room and we offered to clean the room and move rooms for you on the second night. Being short staffed is no excuse and will address this with the management team. The room was filthy. The night front desk person was extremely rude. Trash bags piled in the ice area. The morning front desk person was very concerned for us checking out after only one night instead of 4 nights. I would never stay there again. I apologize for the experience you had and we have address the issues that you and your mother had during your stay. I show that your credit was issued back to your credit card. and wish you would re-consider the free night certificate that we offered to give us a second chance as it was a hiccup in the day to day of hotel operations and it was not how we normally run things again i apologize. 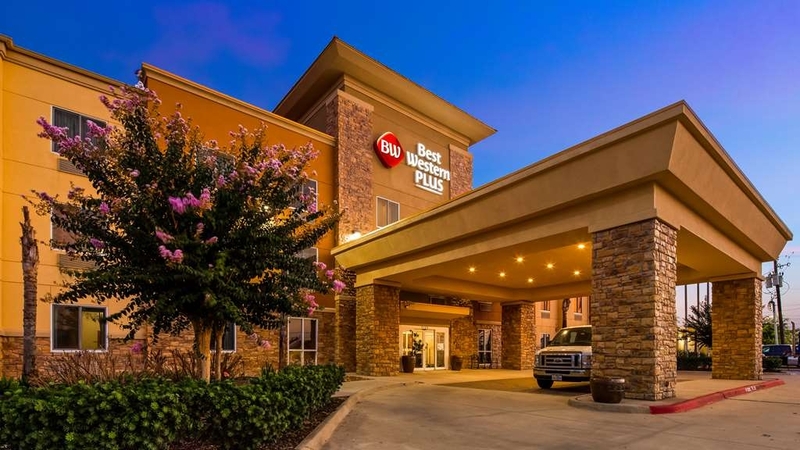 "Personal comments about the hotel"
I had a two day stay at Best Western Plus, Seabrook, Tx. and I did not enjoy my stay. The bed was very uncomfortable. I had to ask for my bed to be changed because it was not clean. My first night I had only one hand towel, and the second day I had towels but only one wash towel. Money was taken from credit card and it took six days to be put back into my account, No one at the front desk knew the reason why, I will not be retuning to this hotel. Thank you for taking the time to do an online review of our hotel. We are sorry that we could not live up to your expectations. I wish I was made aware of your issues when you where staying here because our goal is making sure our guests are happy. I hope you would give us a second chance your feedback helps us improve in all areas of the hotel and appolize for the experience you stated you had. We are sorry that we could not live up to the Best Western & your expectations, and we apologize for apparently running out of food. ruining out of items during breakfast on a sold out weekend. We are working on the staffing issues that also hit us hard that weekend. Again we apologize for the inconvenience. Enjoyed my stay, nice pool, nice polite helpful staff and great breakfast too. 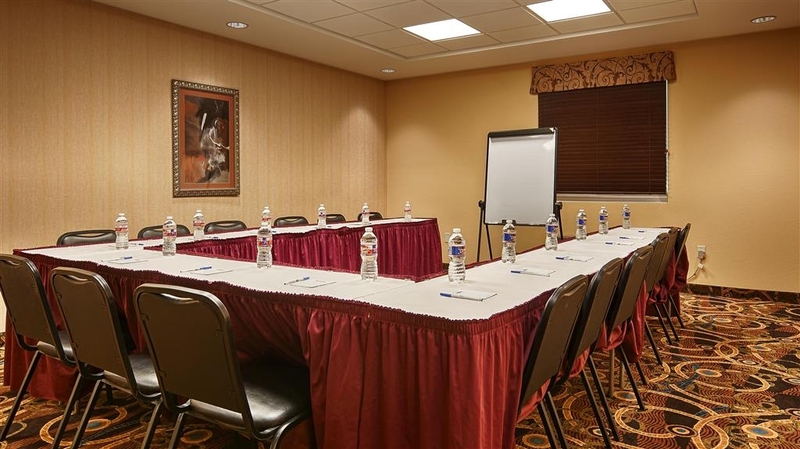 The hotel is very close to Kemah Boardwalk and NASA but located in a quiet location. The bed could be a little better but was clean and had lots of lighting and mirrors in the bathroom and bedroom. Thank you for taking to time to complete and online review of the hotel we are glad that you enjoyed your stay and that you liked our breakfast which defiantly has more then the standard hotel breakfast in this area! My family enjoyed our stay here over the 4th of July weekend. Room was clean and comfortable. Close to Kemah Boardwalk. Breakfast was good. Only complaint is that the cereal bar advertises regular Cheerios which is safe for babies to eat, but it actual had Honey Nut Cheerios in the dispenser. My baby had only a couple before I realized this so nothing bad happened, but my kid's pediatrican has always told me not to give anything with honey, even cereal until two years. I wasn't too worried about it but glad I tried one too before letting her eat too many. 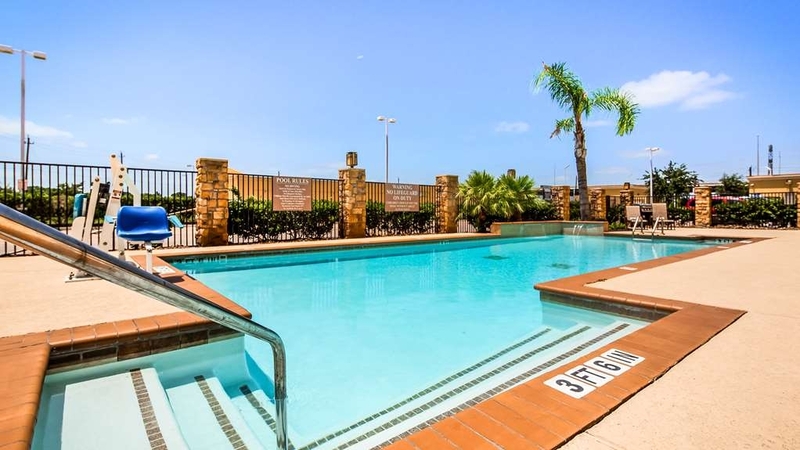 Overall, good choice to stay if you are planning a short trip with the family and are on a budget.My kids enjoyed the pool and loved the Kemah Boardwalk. We might stay here again if we come back in town. Thank you for taking the time to complete and online review we are glad that you enjoyed your stay! Thank you for taking the time to complete and online review we are glad that you enjoyed your stay! We are close to everything and great for a weekend getaway! "Wow is all i can say.."
Front desk was great . Checking in was easy . Get to the room amd noticed right away that the housekeeper did not clean very well .. she did not vaccum and had trash by the window very noticeable also has pretzels underneath the couch when my son took it out to sleep on it .. Maintenance came up to check the room out and wa floored what he saw. he was very nice . "The ac unit was not working properly. There were about one hundred spiders crawling all over the refrigerator/ microwave"
The ac unit was not working properly. There were about one hundred spiders crawling all over the refrigerator/ microwave unit. I thought they were ants but when I looked closer I saw they were spiders. I took pictures and video of the spiders that were crawling around. Not only was my stay uncomfortable but now I have to worry if my luggage was contaminated with all of these baby spiders. Thanks for taking time to do a review on our hotel we're sorry we could not live up to your expectations and do apologize for the inconvenience I will contact our pest control company to have them investigate. If you would like to discuss stay further please feel free to contact me at the hotel directly. Nice, clean and definitely worth the rate. Breakfast is good and overall experience was nice. If your looking for a hotel near the boardwalk this is a hotel worth the price. Definitely will stay here again. This is one of the best Best Western location I've stayed at, particularly in light of the room rate. A tremendous value!! Room was clean with a great fridge & microwave. Very convenient to Johnson Space Center, Kemah and the Clear Lake area...including lots of great restaurants. 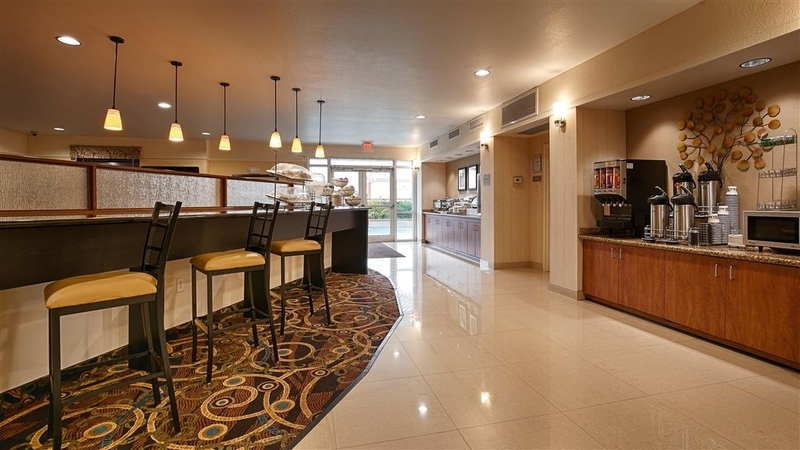 Area and neighborhoods around the hotel are nice...not your typical hotel by the freeway! I highly recommend this hotel! It will be my place to stay when I'm in the Houston area from now on. We booked this hotel before a cruise from Galveston for one night on a Saturday night. We arrived and the hotel couldn't find our reservation at first. I had it screen shot on my phone however and the clerk eventually found it in their computer but it was not booked through the national system. System error, as I had booked through the reservation system! Ok, but now they don't have our king suite!! Long story, short...we were offered a two queen room for a discount and we took it. Now... we needed to print some cruise documents, but their ONE printer is out of ink!!! The nice clerk let me print from their office printer.Thank you!! Room looked clean enough, but my wife was bitten by bed bugs. No doubt in this room!!! Last time staying in this hotel!!! We had a great cruise however!!! I would like to apologize on behalf of the hotel and the staff. I was unaware of this event and would like to make it right please contact me at the hotel and ask for Corey. Dirty rooms, rude employees, TV did not work, refrigerator did not work, breakfast items were cold. Great location to Seabrook and Kimah, that's what makes this so disheartening!!! The GM literally screamed at me for questioning extra charges. "The cleaning and maintenance staff need training"
We stayed at this property last year and it was great. Very surprised how the standards have changed in a year's time. 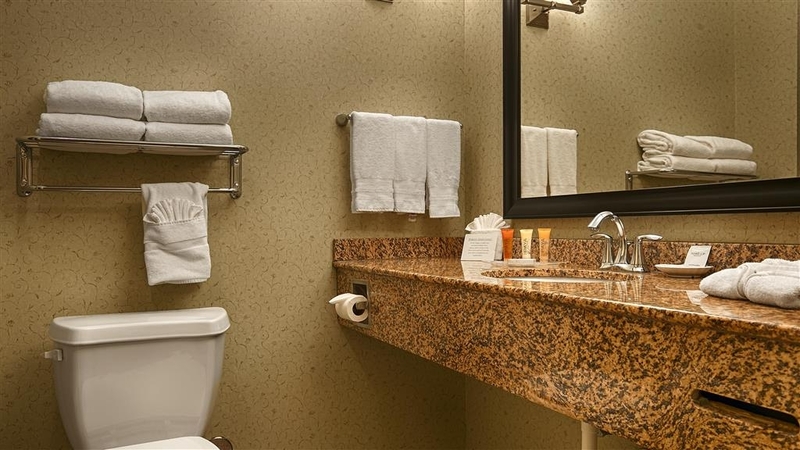 First the good stuff....bathroom clean, bed comfortable, breakfast has lots of options, room is large. The bad stuff....the stairs were not vacuumed the entire 3 days we were there. Same mud, dirt, food for 3 days. The room had patches of ripped carpet, the entire carpet had stains and appeared to not be steam cleaned for a while. Robe hanger behind bathroom door broken, closet door handle broken, the upholstery on both the sofa and chair were stained and dirty. The bench near the door to remove shoes had dried liquid spots. Easy to clean, but left dirty. Went to front desk to ask for sheets and blanket for sofa bed and was told they did not have any. "2017 Keels & Wheels Stay"
The property, as a whole, and room were clean and well appointed. Some of the carpeting is looking worn, but it was clean. The young man who was working the bar was very odd and made socially awkward comments. However, other front desk staff were very friendly and had great dining recommendations. We will definitely be back. "Still a very good hotel in all respects but one"
Last stayed and reviewed this BW on Nov 26, 2016. In almost all respects it's still a very good choice for the immediate area, nothing's changed. Unfortunately, that means they still haven't upgraded the TV reception to something that's watchable. No HD service, means it's all very "snowy". Most channels just aren't watchable. We love it here so much! We will always stay here with we visit The Kemah Boardwalk! The staff is awesome and they always take care of what you need. I would recommend this place to anyone. My children had left their tablets behind and the hotel emailed me right away. The next day I headed back over there to pick them up. Keep up the good work!! "A great value for people visiting Kemah/Clear Lake area"
We ended up with meetings in the Clear Lake area on Friday and Saturday of March Break when Kemah is extremely popular (some would say a zoo). 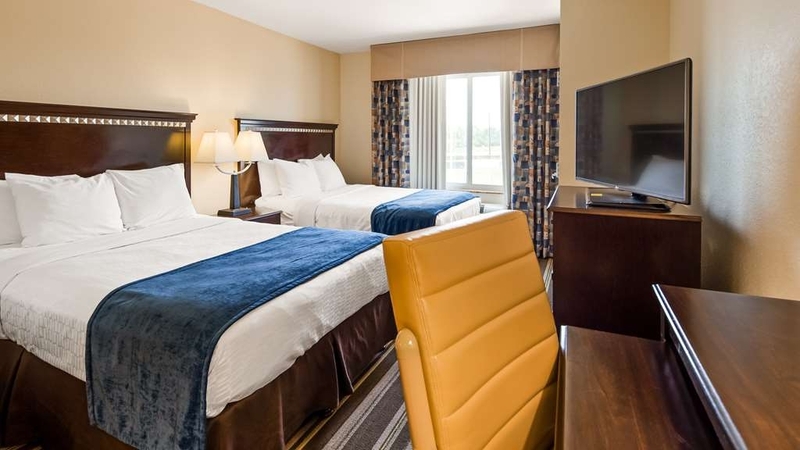 By staying a few miles north of Kemah at the Best Western Plus Seabrook Suites, we received a very spacious room at a good value without paying the premium of being in Kemah. 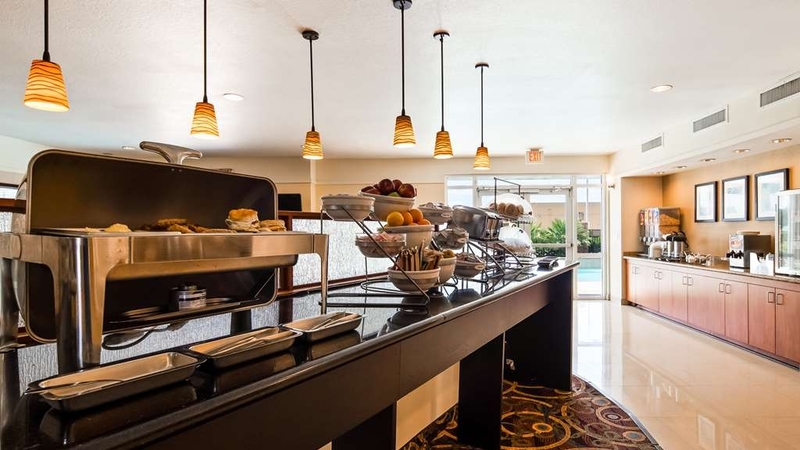 The hotel is very "family friendly" with lots of families, especially enjoying the hot and cold breakfast that is included. In spite of all the families, being a few miles away from "everything" it meant that the hotel was quite quiet. It is well maintained in that we guessed it was 2 years old, only to be told it is 7 years old. 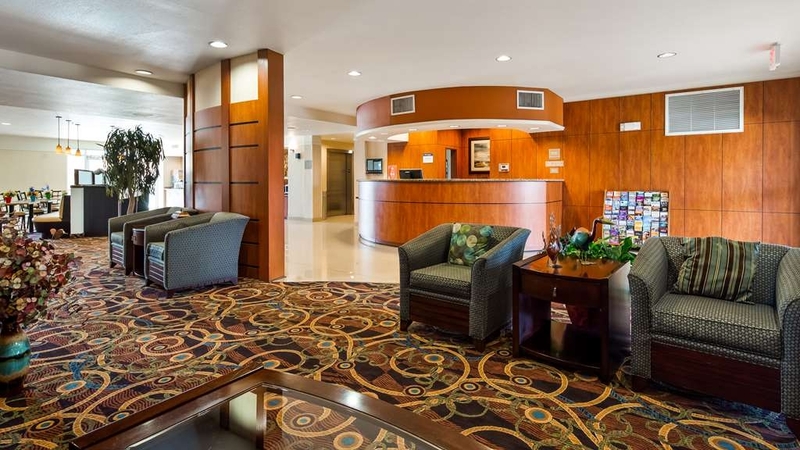 Great Hotel located between two destinations to visit, NASA and Ellington Field. Short drive to the boardwalk and attractions, beach and other areas of interest. The manager and hotel staff were very friendly and outgoing and went beyond what I would have expected. I would like to see more like them in other locations. Great Job! Dear wileybarber, On behalf of my entire staff, I want to thank you for your awesome review of the staff and our property! We strive to give great service and your review shows that we are exceeding our guests expectations. Thank you again! "Best Western has best value." My wife and I were staying at another hotel 2 miles down the road. We got in bed just after midnight and discovered hundreds of ants crawling on the bed, walls and floor. The room was filthy as well, so we got our money back and called Best Western , Seabrook location..They had one room left, so we arrived there at 1 in the morning, and the desk clerk promptly checked us in. The room rate was incredibly cheap considering how nice the hotel and our room was. Our room was nicer than any we have seen for the price we paid. Very clean, beautiful room, Excellent customer service, great rates and surprisingly, a.great breakfast as well. We will definitely be staying there again and often. Dear ryanmR6233PZ, I am so glad you found us and that you enjoyed your stay! Please when you are back in the area come visit us again. It was a fine hotel at a good price. It was somewhere between average and very good. The staff was great. The fitness center was horrible. The room was in-between somewhere. Price was great. Overall, I felt it was a good value. The excellent reviews for the hotel are spot on. Great staff; very clean and modern both in the rooms and the common areas; nice pool area (was too cold to swim); excellent wifi connection but even better it actually had cable internet which is much faster and more secure; rooms are very large including the bathroom too; nice large breakfast area; excellent business center (though it's a bit too public). It's location is OK but not optimal. Located semi-rural between Seabrook and La Porte, there's nothing in walking distance. 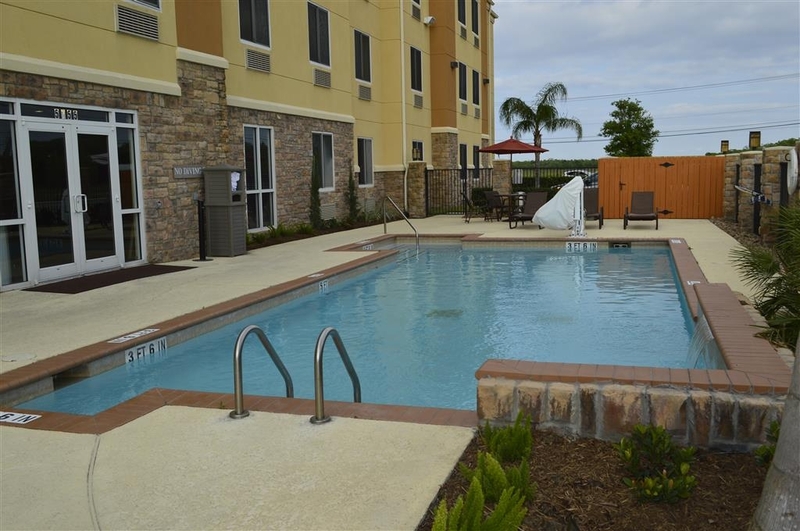 2 1/2 miles to Seabrook restaurants, 4 miles to the Kemah boardwalk. The only real negative is the lack of HD TV. Like many less-than-upscale hotels it doesn't bother to pay for HD TV service though it has nice large HD TV's. Why? The room was clean and comfortable. Staff was very pleasant and helpful. Shuttle is provided for local places and hotel is within decent driving (min minutes max) to stores and restaurants. Breakfast was better than I anticipated, scrambled eggs, hard boiled eggs, pancakes, bagels, juice...etc. It was a decent start to the day. Great Hotel, Great Staff, very clean and entire staff over the top accommodating to make our three day stay a top notch experience!!! Close to an amazing amount of restaurants, activities, and shopping just down the road to the south headed towards Rally. "A Value Place to Stay"
This hotel was a good value because it was close enough to Kemah to be convenient, but far enough away to have a better price than something closer. It's a standard "better hotel" with large and comfortable rooms (and baths), including a sofa bed. Bed was comfortable and the TV worked. Linens were light and clean. Stayed 2 nights and did not get clean towels the second day because we left them on the racks (didn't see the sign.) Security was a concern, as a stranger was given a key to our room. Perhaps a human error, but the staff was oddly distracted when we checked in and did not seemed very apologetic or concerned with we called to report the problem. Also, the door to the adjacent room was not locked. Good thing I checked. Breakfast was very good with fruit, yogurt, eggs, and a pancake machine. Overall, a good place, but make sure your room is not double booked and all doors are securely locked. "Exactly why I love to stay at Best Western..."
We were in town for a wedding. The staff knew this and made sure all of our rooms were available and ready so we could check in before regular check in time. So helpful! I LOVED that you had Earl Grey tea bags available at breakfast. Most places only have the regular Lipton black tea. Wish the eggs at breakfast didn't have ham in them but otherwise was very satisfied with this hotel. I try to always stay at Best Western wherever I'm going because I'm so rarely disappointed, this time was no exception. A very clean and comfortable place to stay at . Friendly and helpful staff. A full warm breakfast with lots to choose from. 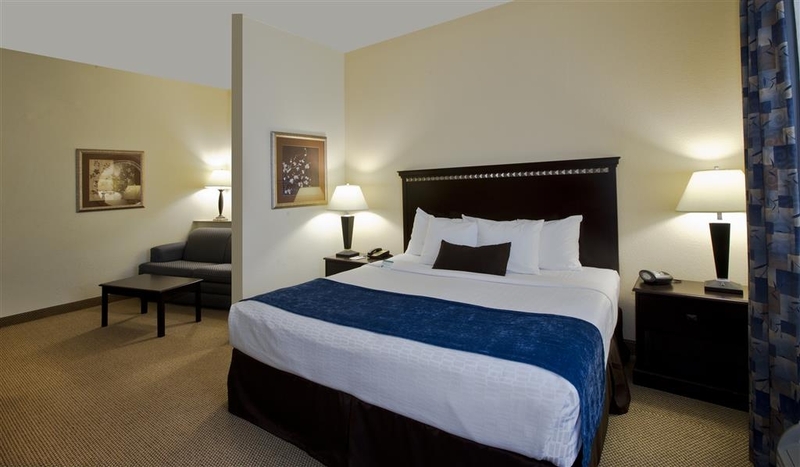 Very comfortable beds Close to the Johnson Space Center, nice beaches and parks .Lots of shopping restaurants near by. We stayed here so we could visit NASA Space Center Houston which was about 7 miles away. Staff were very friendly. Price was terrific. The hotel was easy to get to. Our room was nice and comfortable. Wifi was great. Breakfast was good. One night we came back from a long day and they even had wine, drinks and snacks! When we got up our final morning there was no hot water...so no shower! And then computers were out so they emailed our bill to us later when things were up and running! Things do sometimes happen! Hotel is nice, clean, quiet & pet friendly. 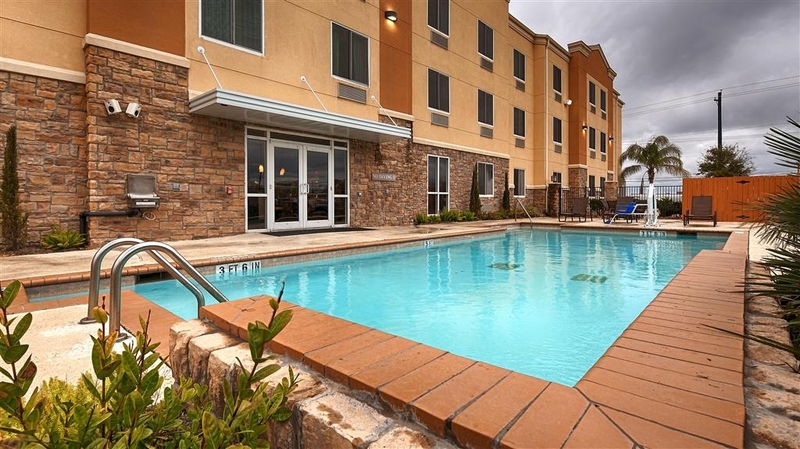 Location is Great like 10 minutes away from the Kemah Boardwalk. Also there are plenty of food places and stores nearby as well.There is a gas station located in front of the hotel for convenience. Here for a few days (leisure) before a conference in North Houston. Other than the room feeling wet - perhaps they need humidifiers?, this was an excellent place to stay. The staff was EXCEPTIONAL. Look up James, Tiffany, and her mom who works in guest services and have fun! This place is the best!! The staff is very friendly and the rooms are very nice. If we ever needed something they were there for us. The price is good and the hotel is not too far from any attractions. It is very family oriented and would go back there for our next family vacation!! The staff was great from the front desk to housekeeping. Our room was clean and comfortable. 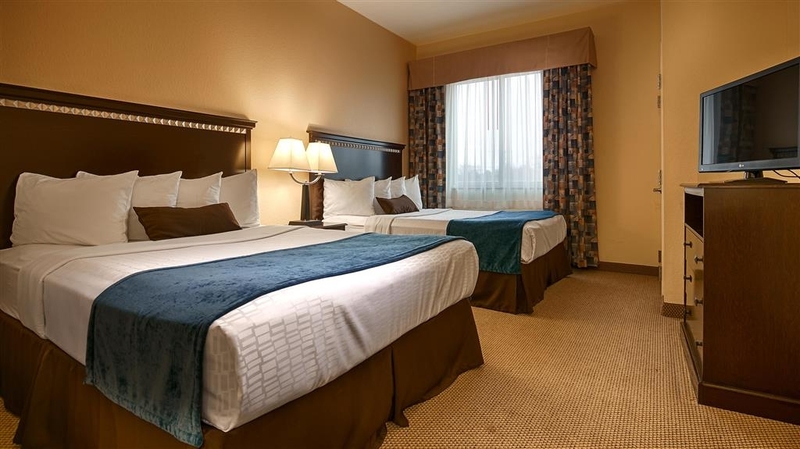 The location is easy to get to,and Kemah Boardwalk is a 9 mins drive, if you want to be in walking distant to the boardwalk this is not the hotel. My husband & I were please with this hotel. Our only complaint is that there were no In-Room Safes. I stayed 2 nites over the Labor Day weekend.Arrived a bit early to check -in but, no delay as other posters have mentioned. Desk person pleasant, informative. Requested room on 3rd floor and request granted. Room spacious, clean. Loved the little things like better grade tissue and toilet paper, the separate charger hub for my cell phone and tablet/ camera. Room had large closet, fold out couch and king bed. The microwave, coffee maker and min fridge worked well. Freezer in fridge even kept my ice packs frozen! Room close to elevator/ ice machine but, not noisy. View from my window faced north, industrial area but, open field across. Gas station in front at hwy, bigger place, seemed clean. There was also a Subway next door. Close to Kemah and all it's activities. Easy access to Hwy 146(in front) and about 8 miles from Baybrook Mall with NASA in between. Breakfast plentiful, cereal/ oatmeal/ pancakes/ fruit/ pastries/toast/ bagels/ eggs/ sausage/ juices/ tea/ coffee. Free shuttle is heaven..driver James a great guy to can get around any traffic, taking a more scenic route. Pool clean if a bit small but, not crowded. Wifi worked great. Vera at the desk also wonderful and friendly. I would stay again. We took NCL cruises out of the port of Houston in 2015 and 2016, and stayed here the prior night both times. The Hotel is clean, quiet, and the front desk staff are friendly. The included breakfast is delicious, if mildly chaotic, and their port shuttle service was wonderful! Pro tip, though: You cant sign up for the shuttle until you have yourselves and your baggage downstairs on the morning of checkout. Do that first, and you can be on the first shuttle. It is very close to NASA, Kemah, and the port. Too bad the port isnt doing cruises anymore! Hello Laurie, Thank you so much for taking the time to review your stay with us. We know you have many choices and we appreciate that we were given the opportunity to earn your business! We are also sad that the cruises have left our area but we hope that you will come back to enjoy all that the Gulf Coast has to offer outside of cruises. We hope to see you again! I was very pleased with my recent stay. Easy to get to and close to major attractions/restaurants. Clean and quiet. Friendly employees. 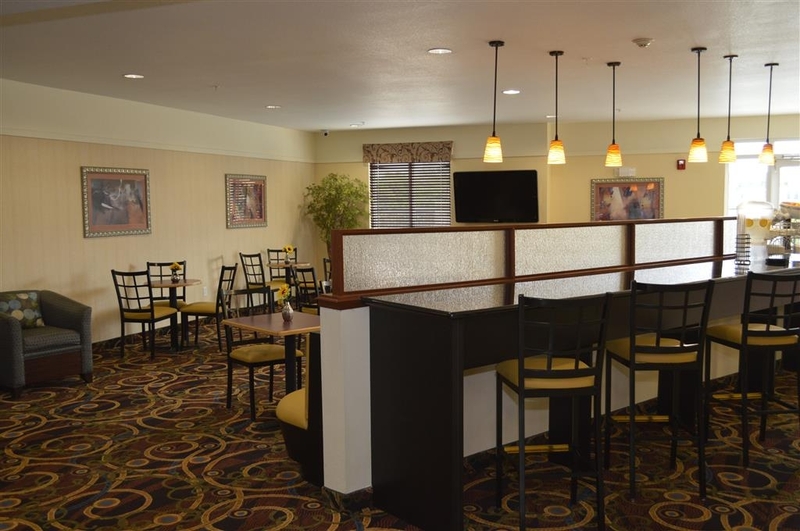 Good Continental breakfast and comfortable reception area for reading or watching TV. "Nice room for one night stay"
We arrived late that night and stayed one night. The room was nice, but there were a lot of people staying there that night so it was kind of noisy. Looked to be a baseball tournament of some kind with all the kids running around in uniforms. Good hotel for the price and duration of stay. This hotel, was clean, had helpful staff, a free breakfast, pool and easy access to interstate. A great value for price point. 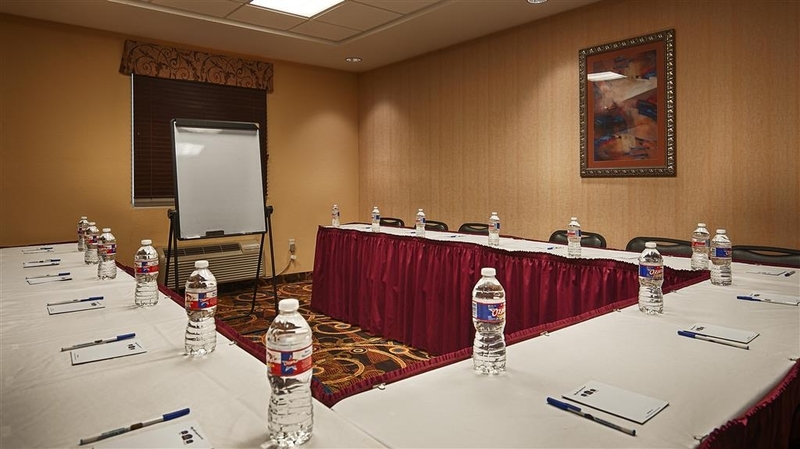 A great option for if you don't want to pay Galveston hotel prices but want to be close by. "Great location for Houston Yacht Club"
My husband and I were attending a special event at Houston Yacht Club and found this hotel online. Vera at the front desk and Stephanie the breakfast hostess were exceptional with customer service. When we arrived (about 2:30) we asked if we could check in a little early (check in is 3:00) and were told we couldn't. We left and got lunch at Tookies down hwy 146 (exceptional food). We returned at about 3:30 and were told our room wasn't ready yet. I finally convinced my impatient husband to just sit and wait in the lobby (he was ready to find a different hotel). Our room was finally ready at around 4:30. Vera was very apologetic and even took a little off of our bill. The room was fine. It had an odd smell, but we were just relieved to be in it. We stayed 3 nights and had to ask for additional towels two days since the weather is hot and humid, which means you shower more than once a day. I did find out that they were short staffed in housekeeping...the manager was even helping with cleaning. Hopefully that gets rectified so other guests get checked in more quickly. Thank you so much for giving a review of your experience with us. I am working with the team to correct any deficiencies and will be addressing your concerns at our meeting this week. We are in the process of hiring additional housekeeping attendants this week to rectify the long waits for our guests. The staff was great from check in to check out, the room was clean and neat, the breakfast was awesome, will gladly recommend this hotel to everyone. Easy access to all the surrounding attractions. Will stay there again. Dear Marilyn, Thank you so much for taking the time to review your experience with us! We have had some challenges and are working very diligently to overcome all obstacles and I am happy to see that we were successful with your stay! We look forward to your next visit! Bad Odor, water leaks in room. Told by front desk that it was because if the rain. Water coming in on 2nd floor because of rain, does not make sense. Stay away and save your money. Megan at front desk was not helpful at all, made us wrong for smelling mold in room. Only offered us 10% of bill, no other room. I will never stay there again. Dear Mr. Ronnie, I would like to apologize for your experience with us. I have had my maintenance team looking into your concerns of water leaking in your room, but we have not found any leaks. We have been working with our team to pull out all air conditioners and get them serviced to ensure they are not causing any issues in the rooms. Again, I do apologize that your stay was not a success and we will be working hard to ensure this does not happen in the future. "Great place to stay quiet"
We picked this hotel since it was close to NASA and by the beach. It was close to the boardwalk and other attractions. The free shuttle to these places was very relaxing so we did not have to drive or pay for parking. It was a great help. Thank you so much for taking the time to review your stay with us. We know you have many choices and we appreciate that we were given the opportunity to earn your business! We hope to see you again! These folks were so kind and shuttled us all over town. When our room was not ready upon arrival they quickly got it cleaned and offered us anything we wanted from their snack room (which usually must be paid for) while we waited. Hi Sheila, I am so happy to hear that everyone was very accommodating in making your stay comfortable and enjoyable. We appreciate all of our guests and appreciate the reviews so that we may continue to provide superior service. Great location! Soft beds! It didn't take long to get to Galveston. Overnight stay before we cruise. Will stay here again! We always stay at Best Western. Not far from the boardwalk or other great places! Family friendly. "Son and Daughter in law stayed for one night"
I booked the one night on here and it was cheaper than going to the best western website, They both enjoyed it very much and had a very comfortable stay, Easy access to Kemah and Galveston, They also had their small dog and had to pay an additional 25 dollars for the night, I was very pleased with the service when I went in to confirm the reservation and the front desk clerk was very friendly. Even used my best western rewards card to get points. Would book this hotel again. "Clean and Comfy and Close to Fun"
We like to stay in Seabrook when we go to Galveston and Kemah. It's a lot less expensive than on the Seawall. This was our first time at this Best Western. It was excellent!l We arrived after 8 pm, tired from the beach sun. The lady at the desk was so friendly and welcoming. The hotel was very clean and well decorated. Breakfast was tasty and staff was attentive. The room was so comfortable and clean. The only little problem was the pull out sleeper sofa was positioned in the room where we could barely get to the bathroom when it was in use. We will definitely return! Recently stayed at this hotel for 3 nights and although the rooms were spacious the hotel itself needs better cleaning and is in an isolated area. The distance to Houston and Kemah Boardwalk is the reason I booked to stay here and as we had a hire car the free parking was a bonus. There is a pool on site but it looked a little tired and in need of a good clean and there is no restaurant or bar and it is a bit out of the way with only a petrol station and subway within walking distance. The room itself on first impressions seemed really good but when I opened the curtains the windows were really dirty on the inside and I moved the bedside cabinet out a little to plug my charger in and there were loads of dead insects and cockroaches behind so I don't think it had been vacuumed properly for a long time. Breakfast is included and is quite good with cereal, eggs, sausage and pancakes etc but the little dining area was a mess when we got down there with cereal all over the floor. Either the parents of the kids chucking food everywhere should clean up after themselves or more staff is needed to keep the area tidy. I wouldn't stay here again due to the distance to nearest restaurants and the cleaning issues. We have stayed at several BW Plus this last trip. This one seems old & tired. Nothing a lot of TLC couldn't fix & would help with your overall experience. My first & biggest complaint was finding dried blood on the sheets. That is just gross & should have never happened. It wasn't a huge spot, but big enough the staff should have seen it & thrown the sheet away. Once I brought it to the attention of the desk staff they were replaced ASAP. My other complaint is with the fitness room. I know for most it is not a big deal, but for us it is. The equipment, especially the treadmills need maintenance done on them. Clean towels need to be in the fitness room also. There were only dirty towels. I guess this place would be okay for a overnight stay, but I wouldn't want to stay here to long. "Average 3 star accomodation. Friendly and clean." We stayed, as do many others ... to join a cruise ship at the Bayport Cruise Terminal. 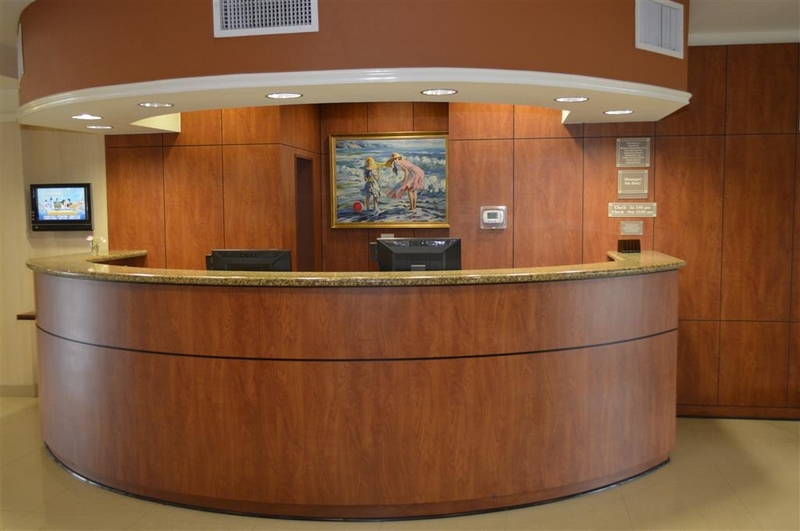 The front desk were very friendly and helpful, especially Tiffany with the big friendly smile. The free shuttle service is definitely a bonus as there is not much nearby in walking distance. The rooms were clean, toiletries provided and quiet ... depending on which side of the hotel you are situated. Breakfast was basic ... everything is disposable. Not a glass to be seen. Go the Kemah Boardwalk on the shuttle. The driver is great with a dry sense of humor. I would recommend this establishment for a short stay if you are going on a cruise, however I believe the cruise terminal has had it's problems and may be closing in the near future. Thanks Tiffany ... go girl. This was a wonderful hotel! We stayed here the night before leaving on our cruise out of Houston. We had a late flight, and then an almost hour wait for the Super Shuttle to get to the airport to take us to the hotel. We didn't arrive at the hotel until around 1:30 in the morning. The staff greeted us and helped us with our luggage (there were 4 of us). The rooms were very nice and comfortable. The breakfast did not have a big variety of selection, but it was enough to satisfy us until we got to the ship. They helped us with our luggage and did not have a problem with us not leaving until almost noon. We had a nice time with their shuttle driver, he had us cracking up! Would highly recommend this hotel. Clean and nice, the beds need upgrading but the rooms all have fridge and microwaves. Nice people. The breakfast was typical hotel breakfast, eggs and sausage, pancake machine, etc. The pool was heated and nice. The view is not the best but Close to the Kemah Boardwalk, which we love!! Hello jojovincent, Thank you so much for your review of your stay with us. We take our guest feedback seriously and I want to thank you for pointing out the areas that we need to improve. I will be taking this back to management so that we can upgrade the items that need upgrading. "Great service for cruise ship customers"
The free shuttle to the Bayport Cruise Port was fabulous - a generous tip was provided for the excellent service. Also, the courtesy shuttle to and from the Kemah Boardwalk was much appreciated - the staff were friendly and courteous. 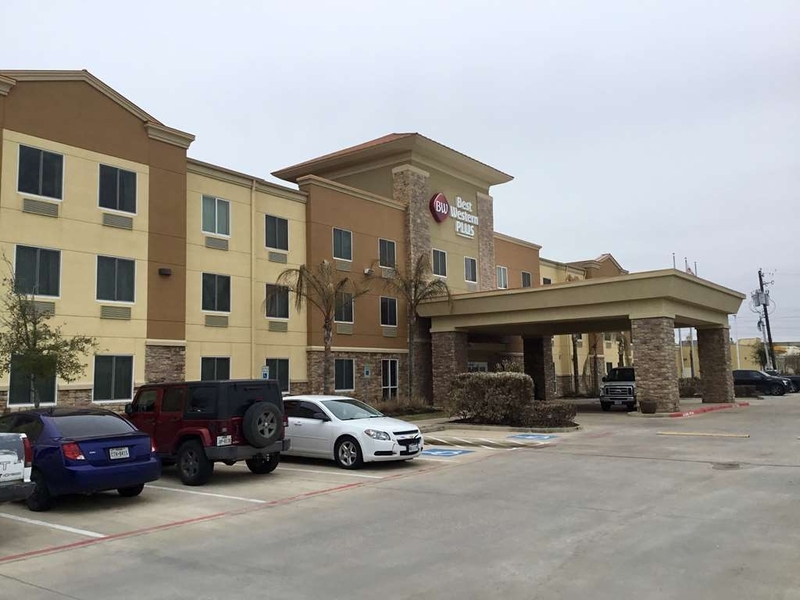 "Review of Best Western in Seabrook, Texas"
Excellent customer service. 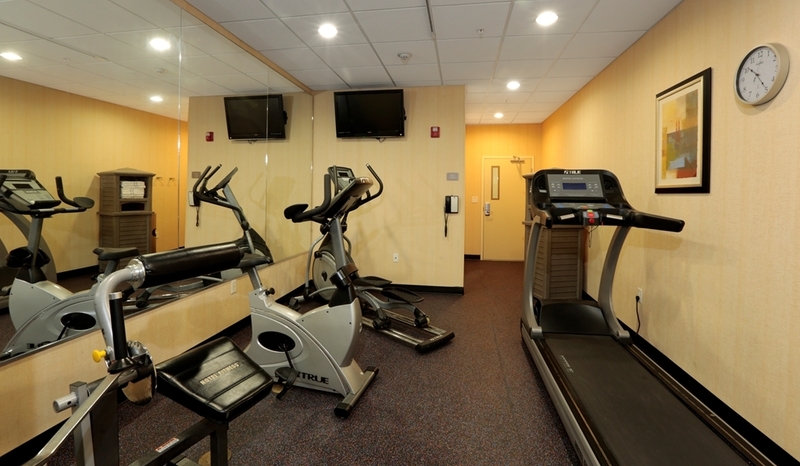 This facility has excellent location and a very friendly staff. I would recommend to anyone. I am a regular customer. I can just call up and make my reservation over the phone. Very easy. We stayed here prior to a cruise. It was great because they had a complimentary shuttle to take us to local areas (including NASA) in the day/evening then to the cruise terminal. Not much around the area but a Shell gas station convenience store but it does sell wine. Stayed at the hotel when sailing out of the Port of Houston. Hotel is very clean, beds comfortable, towels fluffy and evening staff very pleasant. The daytime front counter staff were somewhat unpleasant or perhaps just harried and the breakfasts really rather ordinary but overall the hotel was very good indeed. Very nice and clean hotel. Staffs are professional, helpful and friendly. The whole team is excellent. They made me feel at home. It is my 2nd home now. The best in Seabrook! And the best hotel that I have ever been to, nothing beats! "Excellent product, location & staff." The hotel checks all the boxes! Staff is courteous, professional & helpful. Rooms are excellent - everything works properly, clean, wonderful bathroom facilities, big TV with HBO's and a separate closet. The free breakfast has both hot & cold items, with great variety, and it's very clean. The pancake maker is so COOL. This was a great place to stay the night before we went on our Caribbean Cruise out of Houston. The staff was friendly and helpful in getting us on shuttles to the cruise terminal the next morning. The rooms were comfortable and the hotel was clean. This was very pleasure to stay in this Best Western Plus hotel. The check in and check out were fast and easy. The room were clean and beautiful look. Internet was provided for free. The pool was sparkle clear. The breakfast was good with the auto pan cake machine which was pretty impressed clean. We Stayed at this hotel the night before we left for our cruise, They were so friendly and accomodating, They Shuttled us to the terminal for the cruise and all our luggage at no charge and then let us know we could come back on Sunday the following week to hang out if we had a late flight they picked us up from the cruise terminal and stored our luggage , took us to the boardwalk so we could have lunch, picked us up . This made our traveling day so nice we highly recommend this hotel ! Stayed for one overnight before boarding a cruise ship. A very clean nice hotel and the staff we excellent. The rooms are large, modern and I was amazed at how much space we had. The breakfast was excellent with lots of everything to eat, good variety and fresh. A nice hotel and I would come back! Great hotel for our cruise. Clean, most of the staff was outstanding. The best thing about this hotel was James who drove the shuttle-he was the best!! The hotel is sort of out by itself so you need the shuttle to go to the space center and the boardwalk. The only negative for us was that we didn't have a safe in the room for valuables but we had no problems. Would stay here again. The hotel was very quite. The staff was very helpful. The room was very clean and comfortable. It had a couch which was nice for the kids to relax on. The breakfast was good, although I do like a little more variety. The hotel was very convenient to places that I needed to go. 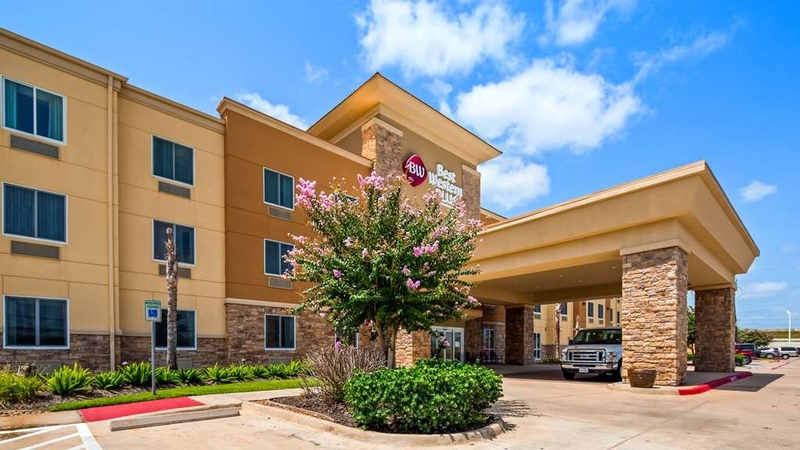 We stayed here one night before our cruise and is only two or three minites away from Houston port do it is very convenient and they have a free shuttle to the port , breakfast is included, rooms are clean and quiet. Good hotel overall ! We arrived a few days early for a cruise from the Bayport terminal. I am a family of 6, this hotel has rooms that accommodated all of us. We arrived in the evening and all of us were hungry. The young lady at the front desk suggested a local restaurant for us and the shuttle driver took us there. The staff there are super friendly and really great in helping you out with everything. The free shuttle service that this hotel is phenomenal. The main driver is super friendly and shows you lots of Seabrook as he drives you to your destinations. We would definitely stay there again when we are in the Seabrook area. Staff is amazing!! They were beyond helpful. What a great experience it was to stay here. The free shuttle was so nice. I have to say, the staff may be the nicest I have ever encountered. I would definitely stay here again. "Great Location for this area"
If you are going down to the Houston Cruise Terminal or NASA area, this is a great place to stay. 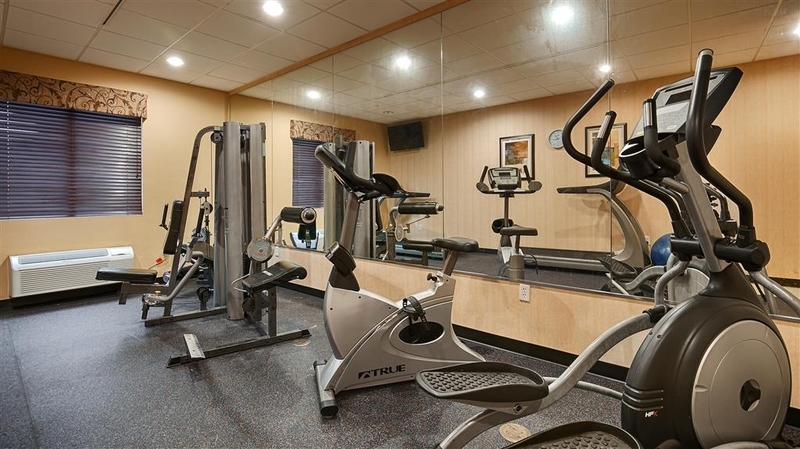 Reasonably priced, great location, nice hotel for the quality, friendly staff. It is close to the Kemah Boardwalk, which is a good place to go to eat either lunch or dinner, with multiple restaurant options. "Great convenience for a cruise, but great anyway"
Wow -- considering this was another "before cruise" night, this hotel and staff did an amazing job. The room was nice and my wife slept ten hours on the "most comfortable mattress ever". The breakfast was kept stocked and was a great pre-cruise energizer. Wish we could have tried the pool -- it looked inviting, but we were on kind of a time crunch and it was kind of cold. The front desk was SO helpful -- first in finding our way through the Friday Houston traffic, then in handling the free port shuttle... only wish I had written the names of these hard working, friendly people! Used the hotel for a stay prior to departing on a cruise. Facility was nice & clean. The pool was clean and great for the kids. The shuttle service was very accomidating to our large group. Definitly worth the price! "Makes cruising a piece of cake"
We stayed here the night before our cruise departure to take advantage of the park and stay as well as the shuttle. If you're going to the cruise terminal, you have to be checked out and have your luggage ready before you sign up for the shuttle. It's a first come, first serve basis, but they have it down to a science, and everything went very smoothly. On the way back, we called and were told to turn right out of the doors to meet the shuttle. Well, the shuttle was on the left, and there was some confusion as to the line for it. There were some unhappy folks whose party had to split up. I'd recommend a better system for the return shuttle from the terminal, but I would definitely stay here again if we cruise out of Galveston. Great breakfast. The staff worked very hard to keep it well stocked with the surge of people wanting breakfast all at the same time. We especially liked the cereal in the bowls and the prepackaged muffins - so handy and a nice variety! "Stopped on way to catch a cruise out of Galveston"
We stayed here instead of closer to Houston or close to Galveston (hotel prices were so much higher there). It was probably a 35 minute drive straight down the coast to catch the cruise. - This hotel also has a park & cruise package where you can leave (park) your care there and they shuttle you to and from your cruise port.. - There is a boardwalk nearby - and the hotel shuttles you to and from and also to the nearby Walmart. It was my husband and 3 young adult children - we got a room with 2 queens and a sleeper sofa - it was perfect. The rooms were clean - breakfast was good. Staff was friendly and very helpful. We will stay here again. Welcomed as old friends. Our group stayed here last year before our cruise and we did the same this year. You couldn't ask for a more accommodating staff. Rooms were clean, spacious and well appointed. A very well run property. Would not hesitate to recommend this hotel. When in Houston I stay in the north area. I am pretty loyal to a hotel when treated nicely. I wish I had more business in this area. The Best Western Seabrook must have an awesome Manager, because they have the best staff. Thank you BW Seabrook. "Great place for cruisers to stay." I am a grandmother and my daughter, her husband, and my 3 grandsons wanted to go to the beach. We looked online for 2 rooms that would be affordable and photos that looked accommodating for our needs. We immediately booked 2 rooms for 1 night at BW Plus Seabrrok Suites, (and it was by the beach )Tiffany at the front desk was delightful. We didn't meet one staff that were unpleasant. That is rare! Highly recommend. Rooms were clean and lots of room. "Great Place! All rooms occupied!" One of the best place to stay in area. Clean hotel with hardworking staff. Ladies worked shifts with little to no extra help when management knew that they were going to be at full capacity. Overall, stay was good and we had a comfortable stay. Great hotel and super staff! From Tiffany on the front desk to James, the shuttle driver we had a great time and enjoyed our stay. Super convenient to the Bayport Cruise Terminal, the Kemah Boardwalk, and the Johnson Space Center. Myself and all of the staff would like to thank you for your excellent review of your stay with us. 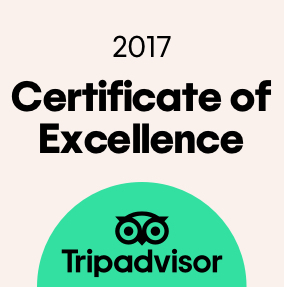 It is our goal to ensure all of our guests receive superior customer service and we are happy to see that we have exceeded your expectations. We hope to see you again on your next trip to the Houston area! If there is anything we can do, please let us know. I travel frequently for work. Couldn't have been happier with y stay at Best Western in Houston. Great customer service. Free shuttle to attractions and Cruise Terminal. Complimentary full breakfast. It's a steal!! This hotel was very clean and accommodating. Nice breakfast. Great shuttle experience within 5 mile radius (to NASA Space center and to the Cruise port. We will use Best Western again in the future. Great Stay. "Nice hotel but out of the way"
We stayed 1 night before and 3 after our cruise out of Bayport. 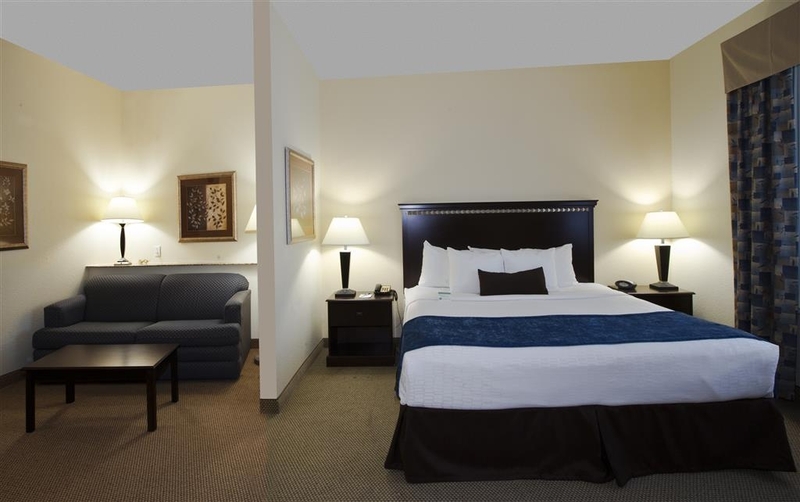 Rooms were clean, staff very friendly and helpful, and reasonably priced. The hotel is out of the way and you need a car to get anywhere (we tried to get a cab but it never showed up). The hotel will shuttle around during certain times of the day. However, on cruise days the cruisers get priority. Free ride to the port! Too cool to try the pool. Right in the middle of nowhere but very handy for the cruise terminal. The hotel is clean and comfortable.The main problem is the lack of a restaurant. There are shops and restaurants within a short drive and there is a free shuttle bus to Kemah Boardwalk which will do pickups ant other restaurants on route. But the night before a cruise this service is very busy and we had to wait more than an hour. Good basic breakfast but very small eating area. "Perfect for staying before cruise! " This is literally the perfect hotel when staying for cruises. They have a free shuttle that takes u to and from the cruise terminal and the pier for free. Not to mention the little tour guide that drives u! Pointed out all the main sites along the way! Beyonces parents house! :) even will stop at the liquor store with u! Free breakfast included that had lots of options including hot. Pool ect. Included in our little welcome packet was lots of coupons for things at the pier! Got a good discount at the aquarium restaurant with these! Only downfall was the first room that we were given. It is Texas and by the sea so the humidity in the room was horrible. Everything was damp, carpet, bedding ect. They quickly set us up n a new room and all was quickly forgotten! will definitely stay at this hotel again when we leave from this cruise port! Checked in a day before our Princess cruise to enjoy the Kemah Boardwalk. This hotel is is in a good location for both and has a very handy shuttle for both. The staff are very friendly and informative and the rooms are comfortable and clean. The breakfast room gets very crowded on cruise mornings, but we all got by fine. We would recommend this hotel for a pre-cruise stay. Not only is the staff friendly and super helpful, this place is clean and comfortable. We stayed for 3 days prior to a cruise, and even though the place was packed, we were treated as if we were the most important people there. Seriously great staff!!! "Stay and park prior to cruise"
You can count on this hotel for great staff and the usual Best Western amenities like the breakfast. Having a shuttle at your disposal made going to the docks, NASA and Kemah Board walk very effortless. This was helpful as there is nowhere within walking distance to dine other than a Subway. Overall a very nice BW stay. Booked here prior to a princess cruise. Good location to port and good breakfast although difficult to get seating. A good location and hotel was ruined by miss advice on shuttle, no restaurants close but their 15 minute wait turned into an hour which left a rushed meal to get the last shuttle back. If only they had said the truth we would have got a cab. Arrived at Best Western night before Princess Cruise was to leave Houston Bayport Cruise Terminal nearby !! Room was excellent and desk staff very friendly and efficient. Amazed hotel had a free shuttle to the Kemah Boardwalk attraction nearby. Many great dining places there by Landrys. About 5 minute ride. Manager (Who was Awesome) us and two folks we met in lobby she would take us in her car if necessary if van too full. After great meal at the Boardwalk just called hotel for pickup and timely shuutle took us back to hotel. Nice free breakfast in the morning. Hotel van was taking other cruise passengers to port !! Daisy Dees the General manager and her are a real asset to this hotel and the Best Western Brand !! We chose this hotel because it offered complimentary breakfast and complimentary shuttle to the cruise port and local area attractions. We took advantage of the shuttle option the night before and went to Kemah Boardwalk. The driver was prompt and the ride was nice. The shuttle for our cruise the next day was very efficient and the ride was also pleasant. We enjoyed our breakfast. They had a pancake machine like a waffle machine that was very interesting. It made the pancakes by rolling them out somehow. The hotel itself is very welcoming and attractive inside. This hotel offered a lot and we will stay again should that opportunity arise. Please note that we flew in from Houston Hobby airport. "The smell almost drove us away"
I almost always give chain hotels four stars because they have a formula and get things right. This is an exception. Our first room had an overpowering chemical smell, so we asked for and received a second room. It, too, had the same smell. across the hall was the housekeeper cleaning a room. I asked her what the smell was. She showed me a can of “air freshener” which she uses to spray every room after it is made up. Ugh. It smells like those little deodorant cakes they put in urinals. Why they would think that refreshes a room escapes me. Fortunately, it isn't a common practice. Perhaps they were hiding something? I asked if she could not spray the room she was working on, and she agreed. So we got that room. Otherwise, we would have had to go elsewhere. We went out for the evening using the shuttle. Getting back was very difficult, as we waited almost two hours. One van, one driver, much demand. Don't count on the shuttle. The staff here were all friendly and helpful. The windows open, which I like, but it was very noisy outside, with traffic the entire night and some big industrial noise that came on periodically throughout the night (sounding like a jet engine being tested). The breakfast was typical and minimal. We usually stay at Hampton Inn, of which there is one not far away. However, friends in our cruise group were staying here, so we joined them. Fortunately we had a car to drive to the cruise port in the morning, avoiding the chaos with the free shuttle. I see no reason to come back here before our next cruise. "Great customer service and free area shuttle"
The front desk staff and shuttle driver are friendly and helpful. The location is perfect for anyone taking a cruise from the Port of Houston: it's free! The hotel shuttle will also take you to places in the area like the Kemah Boardwalk, area restaurants or even WalMart. Keep in mind that the shuttle ONLY goes to the port during the morning hours. The complimentary breakfast offers a nice variety. We chose this hotel for the free shuttle to the cruise ship. They have this down. You check out in the morning and sign up for the shuttle. It does still take a couple hours, but they know what they are doing. We also booked for the night after our cruise. Called the hotel after we disembarked and was picked up with the half hour. Nice ride back in the truck. Waited by the pool for our room to be ready and the princess cruises shuttled to their ship. Dropped bags in room and off again in the free shuttle to the boardwalk. Great day walking around and eating, another call to the hotel and the shuttle was back again. Free breakfast in the morning, nice size room. The shuttle makes this hotel a wonderful value! Great Experience before our Caribbean cruise for my family of four. Especially friendly and helpful shuttle driver who took us to the boardwalk and also delivered us to our cruise ship. The staff at the hotel was very helpful and organized in getting the many people to their ships. Excellant hotel if you are leaving on a cruise. Loved the FREE shuttle to area attractions. Also the Mini mart right next door was great we were able to purchase water and Sodas and Wine to bring with us on the Cruise. Would definitely return. Very large, quiet rooms. Hotel manager was very friendly and interested in your satisfaction. It's definitely the best option if you are embarking on a cruise from Houston Bayport terminal. Enterprise car rental is about 1 1/2 miles away, so convenient for the hotel shuttle to pick you up and return to hotel, or use Enterprise shuttle to the cruise terminal. We were looking for a nice place to spend the night before our cruise. Best Western is about a mile from the cruise terminal and offer parking and a shuttle to the terminal. They also offer shuttle service to some of the local restaurants. The staff is very friendly, helpful and professional. "Very Close to cruise port"
Wonderful hotel to stay in as it is very close to the cruise terminal. They did have a shuttle to take you to various places. We used it to go to the River Walk and others used it to go to NASA. Enjoyed our stay. very friendly staff really enjoyed staying at this hotel. They shuttle was on time and went above and beyond the call of duty. Will stay at this hotel again and have already referred people to stay at this hotel. Hotel was nice and had nice lobby, clean room, nice big bathroom, fridge, microwave, internet, cable, and hot breakfast which my kids loved. Only problem was staff could not find my Booking.com reservation. I provided a confirmation email and booking number and they said nothing they could do, I had to call Booking.com. Called Booking and was on hold forever. Then they said they had my reservation. I just wished they acted like they cared. Otherwise, the room was great! We recently stayed at Seabrook Suites prior to boarding our Princess cruise. We had chosen this hotel because of its proximity to the port and the Space Centre. The hotel provides a free shuttle to the port for its guests and also a shuttle to the nearby attractions. The rooms are clean and spacious. Check in was easy due to the efficiency of the staff. We stayed for 2 nights and enjoyed the provided breakfast each morning. As the shuttle was busy on Sat. morning transporting guests to the cruise terminal, we decided to take a cab to the Space Centre. The woman at the front desk arranged for the cab which came almost immediately. We took the shuttle back to the hotel at the end of the day and then the driver took us to Kemah pier for dinner. The next morning our shuttle to the cruise ship was efficiently organized. Our thanks go out to the fantastic manager and her staff. The hotel is just a couple of miles from the port and offers a free shuttle service in the morning to the cruise ship. The hotel is fine for a pre-cruise stay and the staff are very friendly. The shuttle to the ship went fine despite the large crowd wanting to use the service. The staff took a list of names in the order that you checked out thus preventing lines gathering without any organization. I can't commend the staff enough for their friendliness and organization. The rooms are very clean and roomy. The location is great to go to the USS TEXAS, NASA, Kemah Boardwalk, places to eat. Easy access to highway. Reasonable rates, great staff, great breakfast. The kids loved it. We choose this hotel because they offered parking for our car while we were on a cruise as well as shuttle service to the port. Hotel room was large and very comfortable. The staff are so well organized to get us to and from the port. The staff at this Best Western are phenomenal. We have never encountered such a wonderful experience. Every staff member was so friendly and helpful, registration, maids, shuttle all of them just so great. The hotel was clean and the staff was super. We picked this hotel because we were going on a cruise. The hotel was close to the port and had a shuttle to transport us to the dock. Close and convenient for the cruise. Front desk staff and drivers did a great job after our cruise departure was delayed and we had to remain at the hotel for four hours after check-out. They kept everyone informed, stayed in touch with the port and cruise line, and when we were finally given clearance to go to the port, shuttled everyone there with their luggage very quickly and efficiently! Recommended place to stay if you need to be close the Port of Houston. The shuttle service provided anywhere you need to go within 5 miles is a great amenity because this hotel is in the middle of nowhere! Our party of 10 arrived pretty late in the evening which did not prove to be a problem. Our rooms were ready, clean, and just what we needed before embarking on a cruise out of the Port of Houston. The hotel was primarily filled with awaiting cruisers which is exactly what we expected. Our room was quiet and provided just what we needed before leaving the next morning. Breakfast was pretty packed as most of us seemed to be heading out at the same time. There was plenty of breakfast. The front desk staff was very friendly and helpful. We had a car to load all of the luggage so it wouldn't overcrowd the shuttle. The hotel had a pickup truck to put luggage in which was helpful for those who did not have an extra vehicle. The rest of our group took the shuttle from the hotel to the port. The hotel is not located near much but we knew that when we booked. It serves a need for people who need a place to stay that is near the port. It is the closest hotel to the port and the port is easy to access. "Nice place to stay and very convenient." Spent three nights here. Staff were very. 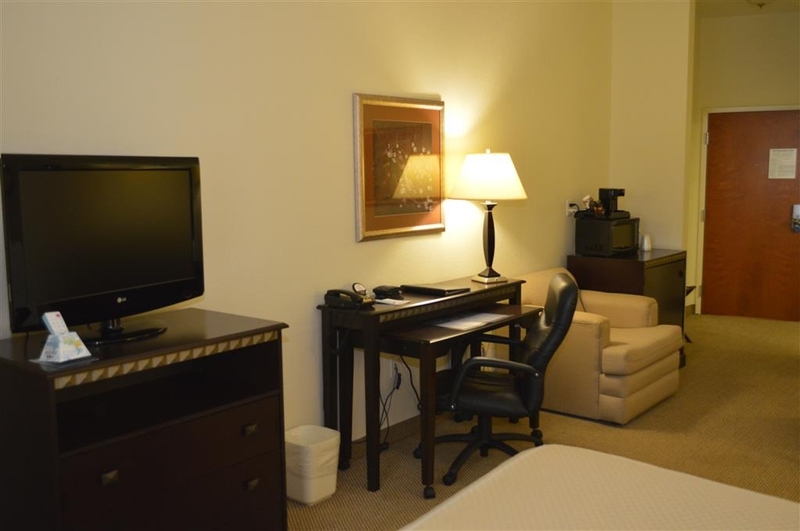 Nice room included: queen bed, sofa, chair, desk, microwave, coffee maker, refrigerator. Continental breakfast included. For the price we thought it was a very good deal. Too cold to go swimming in the pool!! We had a wonderful stay and would gladly stay there again ! Nice staff and cushy room ! The complimentary coffee hit the spot ! The only thing lacking was the view. I'd recommend this hotel to others. I chose this hotel based mostly on reviews here on Trip Advisor. Although I see that the reviews continue to be stellar, my experience was definitely not. The location is indeed very near the port and from what I could tell, cruisers make up the majority of guests. However, the hotel is not near enough to walk to anything but the gas station and a Subway. That means guest must rely on the shuttle. That was problem number one. As a party of 8, we arrived in the early afternoon and thought we were being proactive by attempting to get down to Kemah for an early dinner. At about 3:00 we let the front desk know we would be needing a shuttle. We surely didn't expect instantaneous service. We were told the shuttle driver just left and would return a few minutes later. We waited patiently in the lobby. Another group of guests also asked to be taken somewhere to eat and also waited. After an hour, we inquired again with the front desk attendant. She was very friendly and seemed genuinely confused as to why the shuttle driver (a substitute, not James) was not back yet. Long story short, we finally got in the shuttle about 2 hours after our initial request and the guests behind us gave up completely and walked to Subway. Next problem...our room. We absolutely had the worst room in the place. The window looks out at the stucco fascade which has been built directly in front of it...seriously, a stucco wall about 18 inches from the window, that's all you can see. Not only that, it's directly in front of the elevator. Apparently there were many guests arriving throughout the night because that elevator went "ding" all night long. I mentioned to the desk clerk that we reserved months in advance and paid the same price as our other friends staying in the hotel but we got the worst room in the place. She asked which room, then quickly said "Yes, you're right, it's the worst one". That's it. I suggested that they say something to guests they put there or save it for the desperate "no reservation" guests. The following morning, we were to embark on our cruise. We usually stay in hotels near port with shuttles before cruises, so this was not our first rodeo. It was the least organized least convenient setup we've ever seen. Unlike other hotels, guests may not make shuttle reservations. Rather, you are expected to check out of your room, bring all your luggage to the lobby, then put your name on the waiting list...emphasis on waiting. They use only one shuttle van and load everybody's luggage in the back of a pickup truck (with rain threatening). Other hotels we have been to contract with services to run multiple shuttles to get everyone transferred quickly. We felt lucky to have waited only about 2 hours (in the lobby, watching all our luggage with not enough chairs to seat everyone). There were many behind us. We were dropped off at one end of the terminal and since there were no porters in that area, everyone had to haul all their luggage to the other end of the terminal to check it. At the very least, we could have been dropped off near some porters or the luggage check in door. I do have to say that the staff was generally polite, it's the process which could use improvement. If I every cruise from the Port of Houston again, I will not be staying at this hotel. Although I wouldn't consider this a three star hotel, we we're well taken care of. If you are going on a cruise, I would highly recommend staying here before or after your cruise. Their free shuttle will take you to the port. The driver, James, is awesome. He will also drive you within five miles of the hotel. He took us to the Kemah Boardwalk on Christmas Day. Our room was fine, the "living room" was a bit odd with the angled wall. Breakfast was good, too. The only issue we had was when we went to check out, they couldn't find us and told us nobody was in the room we were in. They found us by name and we were able to check out. This is an excellent and convenient place to stay before your cruise. The staff was awesome and the place was very nice. The price was great for the stay, the shuttle to and from the port and to park our car for the week. Would highly recommend and stay there again for sure! Convenience store next door. No eateries near by. "Good hotel for cruise passengers"
We stayed here the night prior to our cruise our of Bay Point. The front desk staff were friendly and helpful. We arrived in the early evening and were tired and a bit hungry. 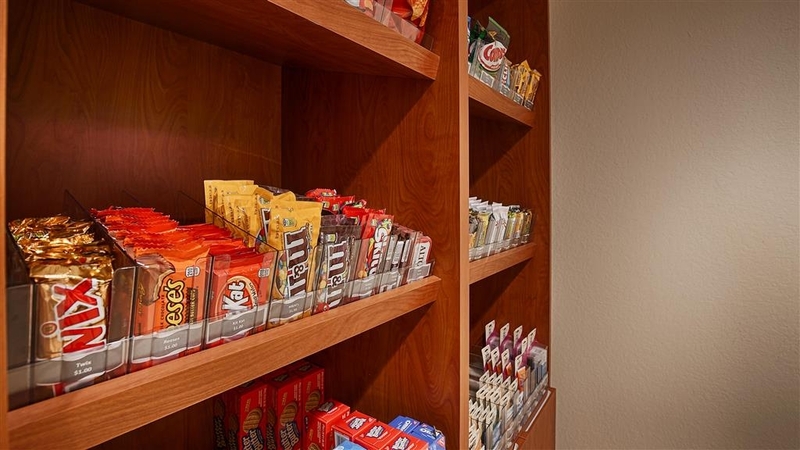 The directly us to small area near the front desk that has a descent selection of snacks and cold drinks. We stayed in a suite which was fairly large, clean, and comfortable. My only issue was that the one window we had in the room was directly in front of a large pillar located at the front of the hotel, blocking any view and light. What we were able to see around the pillar was the front driveway at the entrance to the hotel. Otherwise, buffet breakfast, shuttle service, and staff were great. 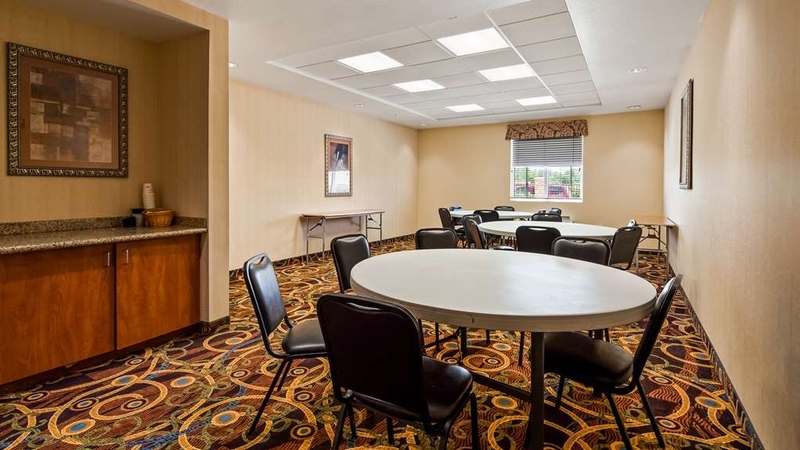 "Convenient for Bayport cruise passengers"
Spacious rooms, friendly staff, good complementary breakfast and a free shuttle to the Bayport Cruise Terminal make the Best Western Plus Seabrook Suites an affordable option for those needing a place to stay before leaving on a cruise. Only problem with getting a good night's sleep is that we needed the air conditioner and it was quite loud. The included breakfast had a number of options, including hot scrambled eggs. Quite a number of cruise passengers stay there and the one shuttle makes continual trips to the cruise terminal. We were on the second trip and were there by 11 a.m. The ship hadn't started boarding yet so we arrived with plenty of time to check-in and wait. We stayed here for two nights prior to departing for a cruise. Rooms are clean and comfortable. There is a free shuttle service that will take you to and from the cruise terminal and also to the restaurants and attractions at the boardwalk. Rate includes breakfast and will fi. Staff extremely friendly and will provide menus for pizza and Chinese which can be delivered to your room. Also has small outdoor pool. Gets extremely busy Friday and Saturday nights with cruise customers. Just wondering what will happen to the hotel when the cruise ships cease to leave out of Bayport terminal next year. The staff was very friendly and helpful during our stay for Christmas. 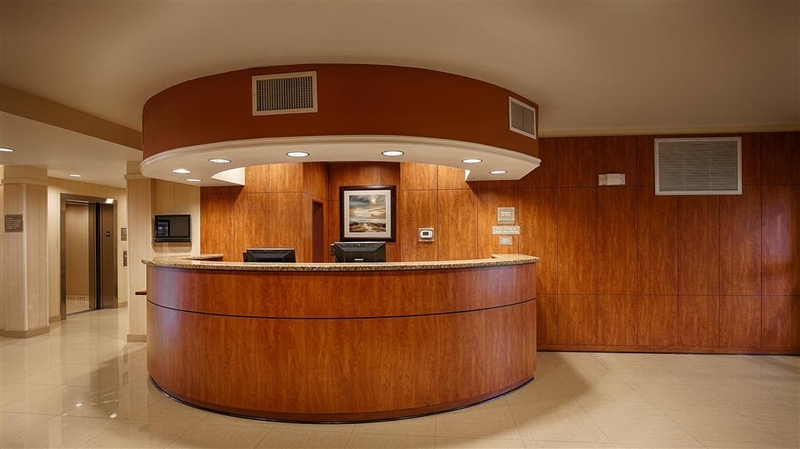 Although most of the staff was off, the front desk was very nice and pleasant in meeting our needs. Will definitely stay there again. We enjoyed our stay at the Best Western Plus Seabrook Suites. We were able to check in a little early. The hotel was under renovation outside so it was a little noisy when we arrived, but the nights were nice and quiet. Our room was comfortable. The staff was very pleasant and fun to visit with. The staff members that transport you in their van are great! All in all, we'd stay there again. We were able to bring our pet, and enjoy our stay for 7days here. The room was kept super clean. I could do my laundry on site, and the needed soap and laundry softener where available for a price. This location is close to the space center, amusements at Galveston, and many eating places. Our family were close by to visit and yet we where close enough to the inner coastal areas for birding, and fishing. We will consider staying here again. "Great place to stay before a cruise"
For the class of hotel, I was very impressed. Service was very good. We didn't have a car and their driver took us to the Kemah Boardwalk for dinner and then picked us up later. It seemed like almost everyone in the hotel was departing on the same cruise but they handled the crowd with precision. Room was clean and comfortable. The hotel seemed brand new so I was surprised to learn it was a few years old. I'm rating this hotel excellent for the service and value for the class of hotel. We like to take cruises out of Houston and this hotel is always where we stay. They offer a Stay and Cruise package that allows us to leave the car at the hotel while we are on our cruises and they have shuttle service to and from the cruise terminal. Excellent accomodations with a shuttle for dinner spots and to port for cruising. The room, the breakfast, the location and the staff were excellent. A shuttle was provided to nearby restaurants and to the port for cruising. Also, was able to leave our vehicle for a week at the hotel and did not have to park at the port. "Here a day before our cruise out of Houston"
Overall it was a good hotel. Many, like us used it prior to the departure. Only 2 miles from the port. Breakfast was just plain nasty! For the price paid $109, It should have been a quality breakfast - It was NOT. We stayed here the night before our cruise and found excellent service in all areas. Everyone at the front desk was very helpful going so far as to help my wife unload our luggage (I can't lift over 10 lbs.). We were delivered to the cruise terminal and picked up promptly the following week. Again they helped my wife load the luggage in the car. The room was great: comfortable, clean, and quite. We stayed here before leaving on a cruise. Everyone made us feel like we were important. We were treated with respect and any needs we had were dealt with professionally and with a smile. It was a great start to our vacation. We stayed here before going on a cruise. The service at this hotel was exceptional. The front desk people were friendly and efficient. Our cruise was delayed by a day due to weather conditions, and we were kept up to date with that progress. We were given special rates when we had to remain at the hotel rather than our cruise ship. Rooms were clean and comfortable. Breakfast was plentiful, but average. The eating area/lobby was appointed nicely and was able to accommodate everyone well. The shuttle service was one of few in the area. The drivers were great. I will say they might like to get a different van, as those in back had quite a climb to their seats. We were able to get to dinner, the Boardwalk, NASA, etc. with no issues. When the demand was great, however, there was a lengthy wait for pick up. If you are going on a cruise, this is the hotel at which to stay. The van actually gets you quick access to the terminal check in process. I would certainly stay here again. This was the best place to stay since it had a free hot breakfast and a free shuttle to Boardwalk for dinning and shopping and to the cruise port, which saved us cab fare on the day of our Princess cruise. Hotel was very clean and the staff quite helpful. The hotel isn't near anywhere to eat, but they offer a shuttle for a radius of five miles, and suggestions on restaurant and shopping . All in all, a very pleasant experience. "Wonderful Service, Clean Hotel (Perfect for Cruisers)"
The hotel is nice and clean. 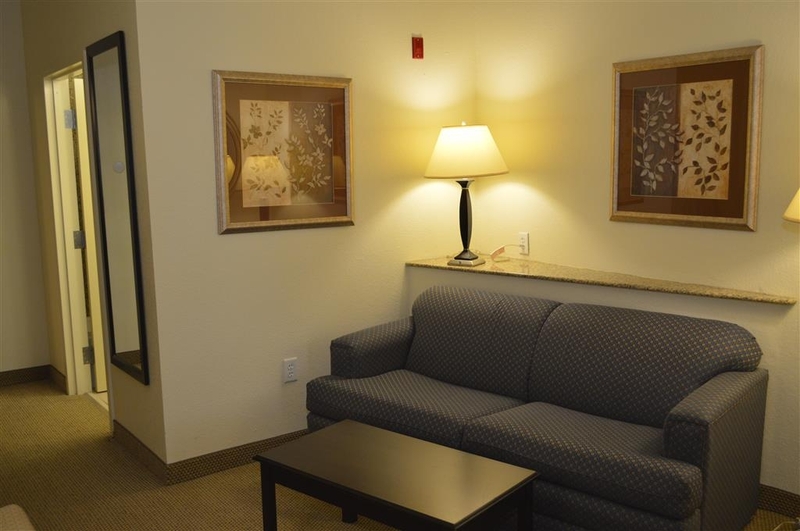 The rooms are large, since they are suites each room includes a pull-out sofa couch, desk, mini fridge, etc. The breakfast included hotel items, yogurts, fruits and fresh coffee. The location is only minutes from the cruise port. While they offer shuttle service, we did not use it for this trip. The staff is wonderful. We staying the weekend that Caribbean Princess could not come into port because of fog. The staff kept everyone informed of information they were receiving. They were kind and polite. When it was apparent we needed to stay an extra night, they offered us a very good rate. I've been in many, many hotels and I think this is the best staff I've ever seen at a hotel. We would stay here again if ever in the area! Great ppl, clean room, smells great. Free shuttle took us to the boardwalk and picked us up at Target. Will be using their free shuttle to take us to the Port for our cruise on Sat. I love how friendly everyone is. There is a variety store Market next door and a Subway. "Nice Stay...But, tried to Over - Charge for pet deposit!" OK...I gave the hotel a 4 out of 5....what kept it from being a perfect stay, was that they tried to over-charge us for the pet deposit...when we "booked" the hotel, we were told of a $20 dollar pet deposit...when we checked in, the wanted $25 dollars...and then I was told by the front desk person (Rea) that it's been $25.00 dollars form the 3 years I have been working here....so, we called the company reservation line back, told them what was going on, they then got involved....and we were only charged $20.00 dollars instead. The lobby was spacious & clean...breakfast bar was good & hot food....the room was very spacious as well...the pool area was clean....so, because of the mess-up on 'over-charging' for pet-deposit, we give a 4 out of 5. We stayed one night before leaving for a Caribbean Cruise. We booked three rooms, and all rooms were treated special. They have a shuttle that took us everywhere we wanted to go the day before the cruise. It took us, then picked us up at the Johnson Space Center, then dropped us off at T Bone Toms for supper, then picked us up from there and took us back to hotel Great service!!! The next morning, they took us to the cruise terminal. Wonderful service, and so accomodating! I would recommend highly! "Great place to stay before a cruise!" This a great place to stay if you are sailing out of the Bayport Cruise Terminal. The staff is very helpful and cooperative in getting you to port when you want. It is kind of in the middle of know were but a free shuttle is provided for restaurants and other recreation. Good value, great facilities. Excellent shuttle availability to Kemah Boardwalk and cruise line. Staff was very helpful in suggesting places to eat and also getting our group together to arrive at the dock in time to report in for our correct cruise time. "Average stay with chaos cruise transport"
"Clean and very freindly staff"
I would say the staff at this hotel are the friendliest and most sincere I have ever encountered. The breakfast was good and it is close to many amenities via their free shuttle service. My family and I would definitely suggest this hotel to other families. The room was clean and well decorated. The hot breakfast was very good. Very nice hotel. The staff was great. Perfect for the night before the cruise. Special thanks too James. the shuttle-bus driver, who took us to dinner the night before. He went above and beyond. "Great facility with great employees"
It was less than 5 minutes from the cruise port & the facility was immaculate. My wife & I would highly recommend this hotel to anyone going on a cruise & needing a place to stay before they leave. I also recommend this place if you are just needing to stay in the area for any reason. Quiet area & very clean!!!! "Awesome place to stay, small amount to pay!!!" We really enjoyed our 1 night stay here! I called the hotel at 11:48 pm the night before our stay and I spoke with a lady named Rae. Mrs. Rae was a very friendly lady who answered all of the questions that I had. She told me that the hotel had been renovated and it used to be a Comfort Suites. She informed me that they have breakfast, refrigerator, microwave and a pool. The next day I traveled from my home and got to the hotel to check in. The look of this hotel was very clean and it smelled wonderful! I was greeted by a nice young man named Caleb, and also a nice older gentleman named James. Caleb and James told me that there were some great restaurants around the area and some of them were featured on the show "Diners, Drive-ins and Dives". That's cool. They said if there was anything they could do to make our stay more comfortable to please let them know. I did have to get some more lotion, and they gave me another bottle. Our room was clean and super comfy. The next morning I got up went downstairs and got breakfast. Breakfast was good and best thing of all it was free and it was included in the stay. My husband had to be somewhere so I was by myself. I packed up all of our things and took them downstairs. There was a lady named Vera at the front desk. She did not notice when I walked out the front door because she was busy with something else. When I came back inside I asked her if we had an ice machine here at this hotel. She rudely said that the ice was only for people staying at the hotel. I informed her that I WAS staying at the hotel. She immediately apologized. But the damage was already done. Besides this issue about the ice I loved this hotel and would definitely come back to stay again. To anyone looking for a great nights sleep in a very comfortable environment I definitely recommend this hotel! "would def stay here again"
The price was affordable. The staff was awesome. The breakfast was good and filling. The room and the restrooms were very clean. This is def one of the best hotels I have stayed in. I would love to stay here again. "Forever Grateful !! Thank You Miss Daisy & Wonderful Staff!!!" My husband and I both are in the oil and gas industry and unfortunately have to spend months away from each other due to our career choices. My husband is working in Pasadena for a minimum of 8 weeks and has only 2 days off, so on his first day off we planned a trip for me to fly down and stay so we can have some much needed quality time together. 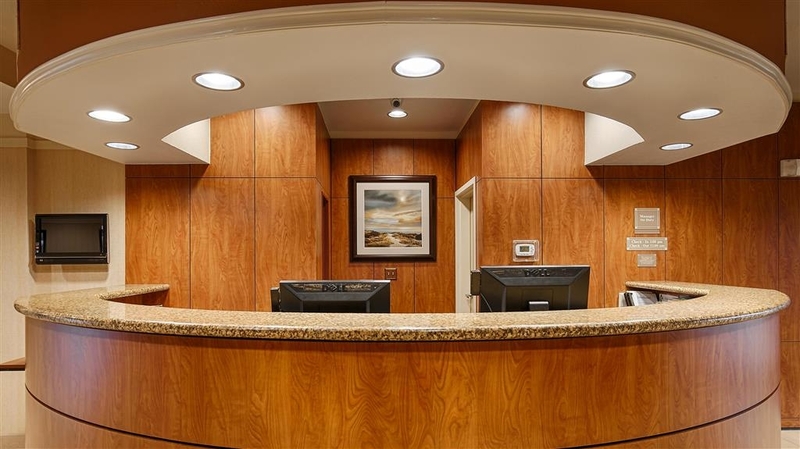 We chose to stay at the Best Western Seabrook because it was close to his job, we are Best Western Platinum members, and the facility looked nice. From the first call to make the reservation, to the very last minuet walking out the door, it was the best experience we had ever had! Abby the driver recommended Kemah Boardwalk for our date night and it was one of the best nights of our lives! My husband had very limited time with me, so the staff did everything possible to make sure we had every min. together and they did it out of the kindness of their hearts. To my husband and I, those extra mins. together are priceless and unforgettable and I will always stay at this location when I am in this area due to the incredible service and appreciation to these people! We are forever grateful to everyone for making our precious night together memorable! Dear Sarah, Thank you so much for the great review! I believe that delivering the best in customer service is one of the most important aspects of our job and I try to instill this in each and every member of the staff. It is so great to see that they went above and beyond to make your time together memorable! We understand the importance of making each minute count and we are always very happy to do whatever we can to ensure our guests get to make the most out of their time here. We look forward to seeing you both again! If there is anything that we can do to help please let us know! A great hotel with a great staff to match! 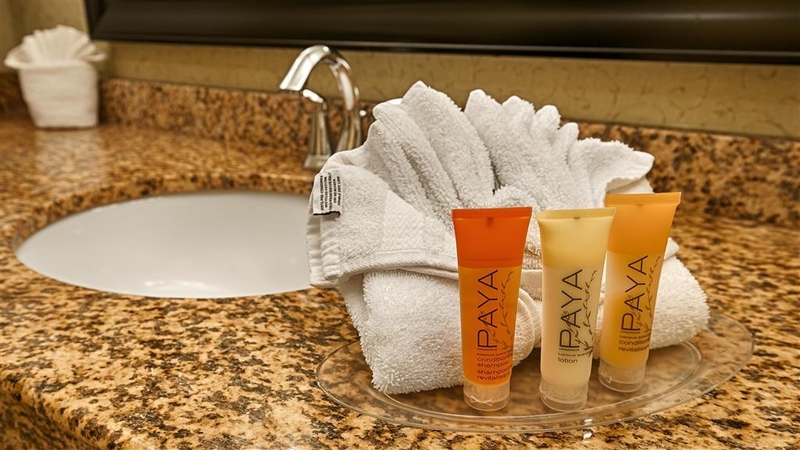 Offering plenty of services to help make your stay amazing. With a courtesy shuttle on stand by, they are able to take you out for a bite to eat, to the board walk, to your cruise ship or just drop you off at the beach so you can enjoy the sun all. Rooms are clean with all up to date TV's, mini fridges, micro waves and of course a coffee maker. 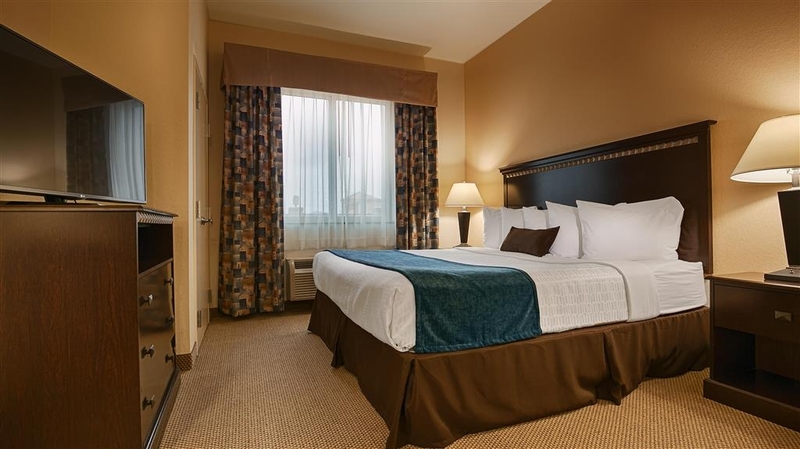 This hotel is very nice, easy to find, and close to the Kemah boardwalk. My husband and I were looking for a quick, quiet getaway and found just what we were looking for. A real find, compared to the cost of many hotels in the area. 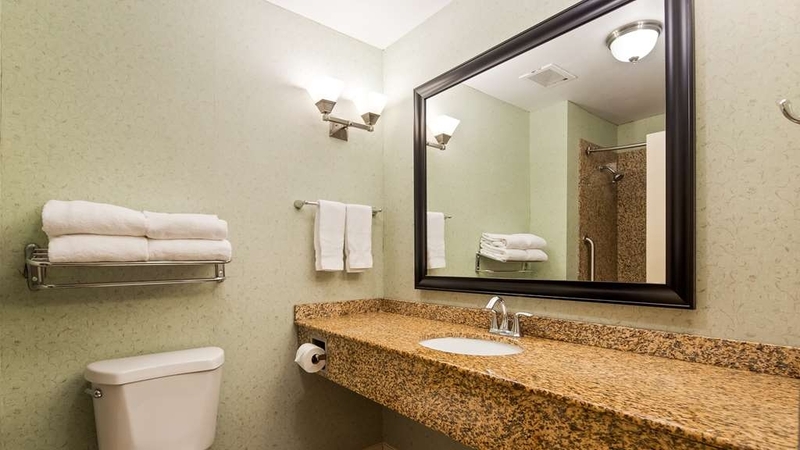 I didn't know what to expect because I usually stay at a different hotel because I get points, but I was pleasantly surprised with the cleanliness and modern look. The staff was very pleasant, helpful and professional. We were looking for a getaway for a couple of nights in the area. This was the most affordable option. So, we didn't expect much. We were blown away with the quality of the hotel, the parking, the pool, the staff, the bed, the breakfast, etc. This was a fantastic experience and we will stay here again.